Halifax: Quinpool Road is very cool! Halifax’s Quinpool Road is a very cool place to flaneur. Why? Because of its fun mix of old and new shops and buildings. No other street in Canada that I have visited has so many merchants with a 25+ year history on the same street. Quinpool Shoe Repair is just one many merchants who have called Quinpool home for decades. 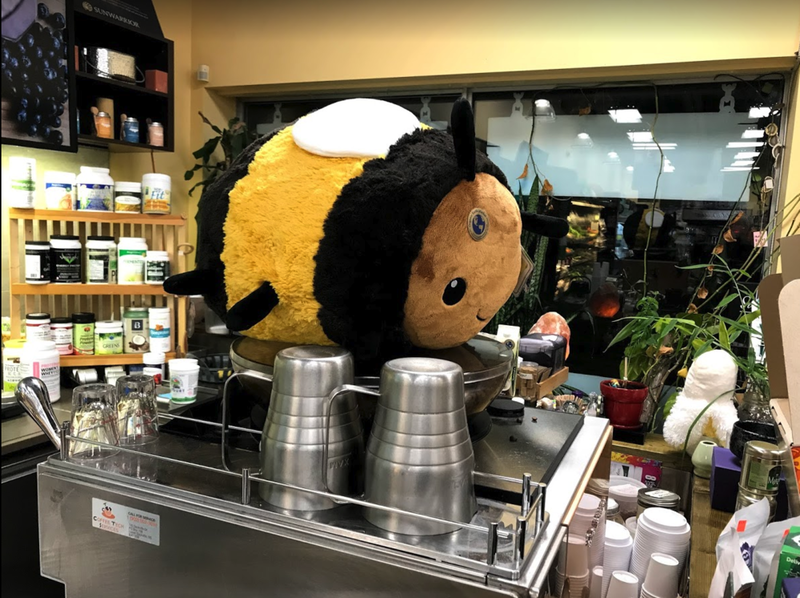 Quinpool’s Organic Earth Market has large stuffies hanging out in strange places throughout the store. Very cool. At first glance, many might dismiss the street as being old and tired, especially if you are just driving by. 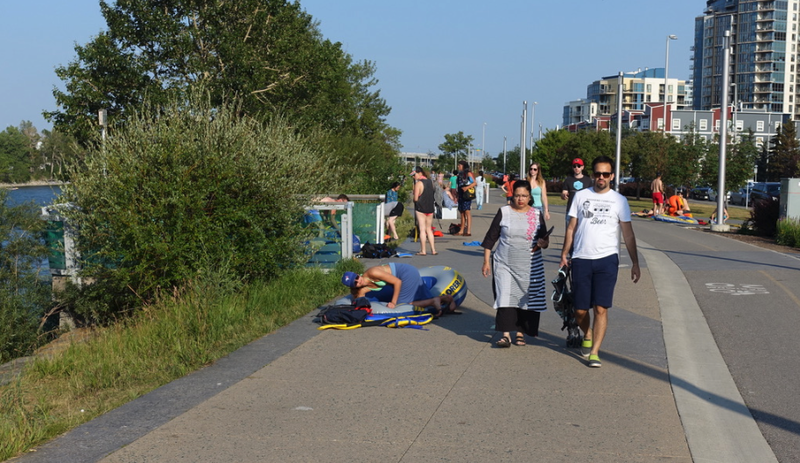 But if you get out of your car, or off the bus and walk along the sidewalk, you will begin to realize there is more to Quinpool Road than meets the eye. I think Jane Jacobs (an urban writer and activist who championed new, community-based approaches to planning from 1960 until her death in 2006), approve of how Quinpool Road is evolving with a nice mix of the old and the new. Halifax’s Quinpool Road is an eclectic mix of old and new “mom and pop” shops. The Keep, Quinpool’s new mixed use condo project is just the beginning of a mega makeover. Quinpool is a walk back in time when inner city communities each had their own Main Street populated by “mom and pop” shops located in a hodge-podge of buildings. There is not designer furniture, street lights or public art. It is an authentic Main Street. Freeman’s Little New York restaurant and bar has been on Quinpool since 1956. Open 24 hours, it remains a popular spot for those who want a late night pizza – to stay or go! A popular happy hour spot too, it is a great place to mix with locals. Quinpool Road is home to perhaps Canada’s best shoe repair shop. I am not kidding. 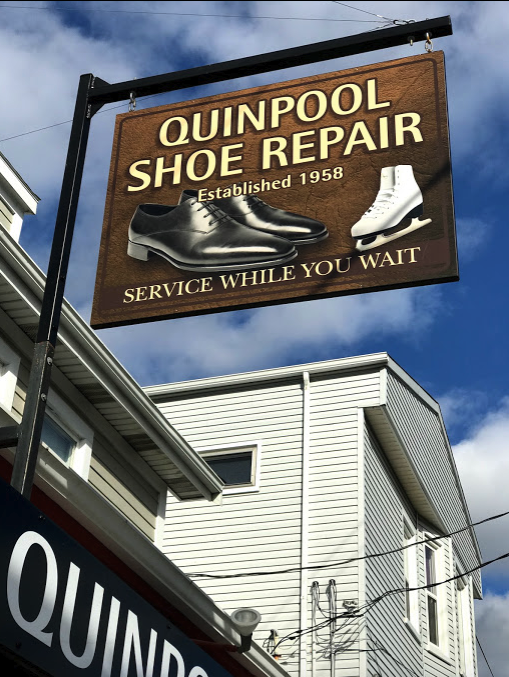 Quinpool Shoe Repair has been operating in the same location since 1958. I was immediately intrigued by the its blade sign that not only includes a shoe, but a skate too. Vintage skate sharpening machine at Quinpool Shoe Repair is very cool. 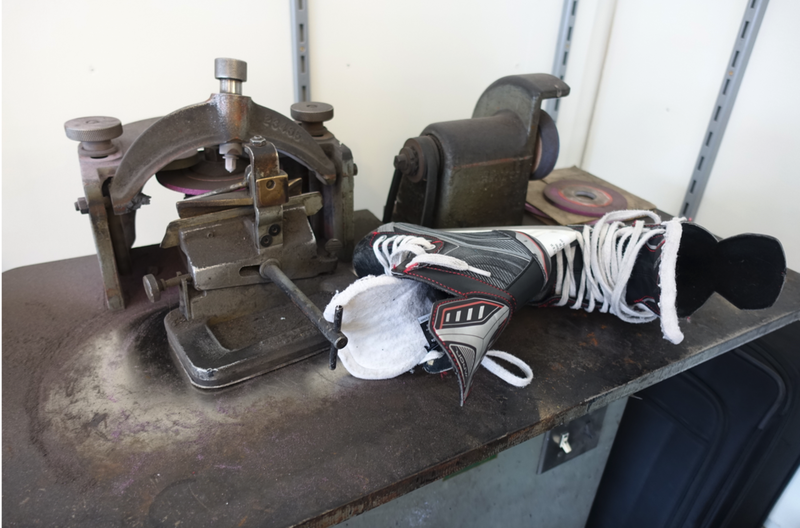 Yes, inside sits an old skate sharpening machine that brought back memories of when I was a kid who used to drop off my skates at a house on the way to elementary school where an old guy (everyone is old when you are 7 or 8) sharpened them on a similar machine in his basement. I would pick them up on the way home. Cost….30 cents I think! But I digress. Quinpool’s Shoe Repair shop is a walk back in time. Note the money on the cash register. While the classic shoe repair shop aroma of leather and polish is in the air, this is no little “hole in the wall” shop. Large, bright, clean and very well organized, including a six-foot long wall of shoe laces – there’s an immediate sense of pride of ownership and craftmanship when you walk in. Quinpool’s Armore Tea Room, has been a Halifax landmark since 1958. Its name harkens back to its early days. Today, it is best described as old fashioned diner serving all day breakfast (including homemade meatloaf, liver and onions) and great milkshakes. Open from 5 am to 8 pm daily, it remains old school with its “cash only” policy. Across the street from Armore is Canada’s first donair shop, “King of Donair” which opened there in 1973. In 2015, Halifax Regional Council proclaimed the donair the official food of Halifax. When I went in and said I was from Calgary, it was quickly pointed out that real donairs have only onions, tomatoes and a sweet and garlicky donair sauce, “none of that lettuce, pickles or cheese junk they add in Western Canada.” You could tell the King is proud to have developed the original recipe. In addition to multiple locations in Halifax, King of Donair has expanded elsewhere in Eastern Canada, as well Western Canada - including Calgary, Edmonton and Grande Prairie. Backstory: Original owner, Peter Gamoulakos created the original 'doner' (what he called it briefly) with lamb topped with tzatziki. But Haligonians did not take to it. So Gamoulakos being an astute businessman, changed the protein to beef, developed the sweet garlicky sauce (using Carnation evaporated milk no less), changed the name to “donair” and a legend was born. He sold the store many years later and King of Donair has changed hands a couple of times since. Despite a few people trying to take credit for the donair, it remains Gamoulakos' legacy. Further up the “Road” is Aerobic First in what at first glance looks like an old, rather non-descript house (because that is what it is). However, curiosity made me walk in to discover a place packed with shoes, skis, boots and other sports wear equipment. Their claim to fame - “our staff are among the best shoe and boot fitters in Canada” according to their website and I believe them. I tried a few pairs on, but resisted as I really don’t need anymore flaneuring shoes. The staff were very friendly and let me browse without feeling awkward. Eventually I struck up a conversation with one of the staff, who turned out to be the owner, who told me they have been in business on Quinpool since 1980. I really wish I needed new flaneuring shoes. Old houses make great boutique stores, cafes and restaurants. Intermingled with the old timers on Quinpool are the “new kids on the road,” the cool new merchants. 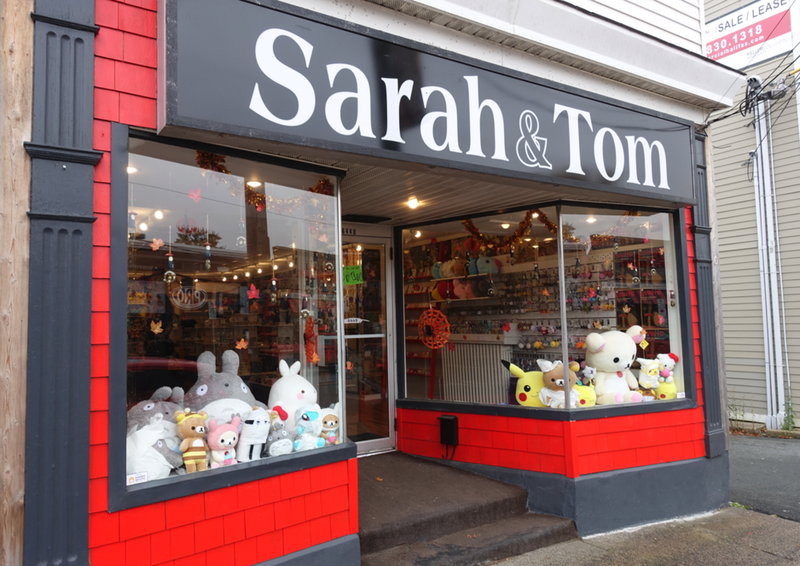 “Sarah and Tom,” a Korean pop culture store recently opened on Quinpool, a sure sign that young people are moving in. At first, I mistook it for a cool kid toy store. It all started when Sarah Milberry from New Glasgow, Nova Scotia went to Korea to teach English, met her husband Tom Yun (aka Tom) and together they decided to bring a bit of Korean retail culture to Canada – they have stores in Toronto and now Halifax. I love today’s global world these days and how it leads to creating cool streets where a Korean toy store meets a skateboard shop. As just across the street from Sarah and Tom sits another new kid on the road, Pro Skate home of Halifax’s skateboarding community. But rather than the typical bohemian looking skater shop, Pro Skate has a friendly upscale atmosphere that even includes a micro café at the front with a few seats looking out onto the street. Very cool. 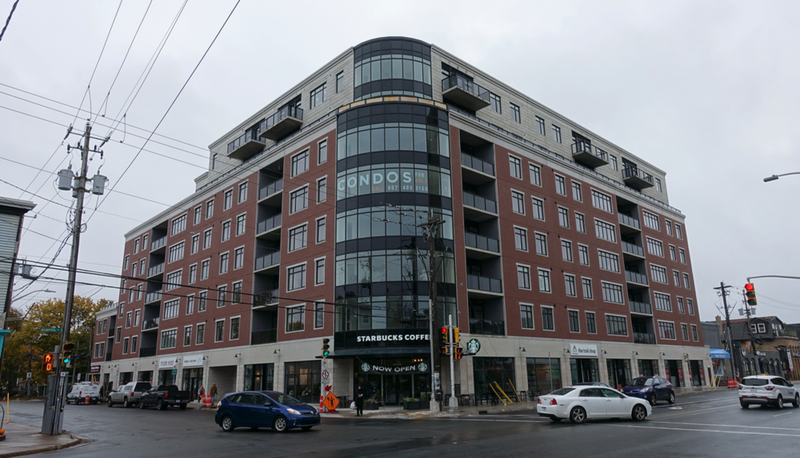 Halifax’s popular Morris East Restaurant + Wine Bar recently opened its third location in Quinpool Road’s The Keep, a mid-rise condo complex. While the restaurant has a full menu, whenever we walked by, it seemed more like a busy pizza parlour where the cool people hang out. Every street needs a couple of good pizza places. In fact, there probably should be a “Pizza Index” to measure street vitality i.e. the more pizza places, the more vitality. Then there is the new home décor store, Zephyr Rug & Home that offers amazing rugs as well as contemporary Canadian, American and Italian furniture. 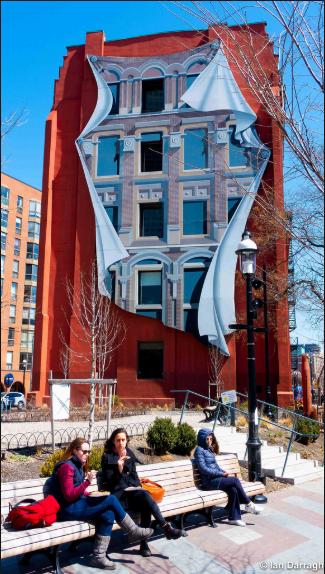 With all the area’s new condos projects (recently opened, under construction and planned) in Halifax’s City Centre, Zephyr could be the catalyst for Quinpool to become a design district. After all, Secord Gallery, one of the longest established art galleries and framing shops in Atlantic Canada dating back to 1979 is also on Quinpool. Looks like a children’s toy store to me….I was wrong! Quinpool has an amazing array of ethnic restaurants and grocery stores – Korean, Greek, Italian, Japanese, Lebanese and Chinese. 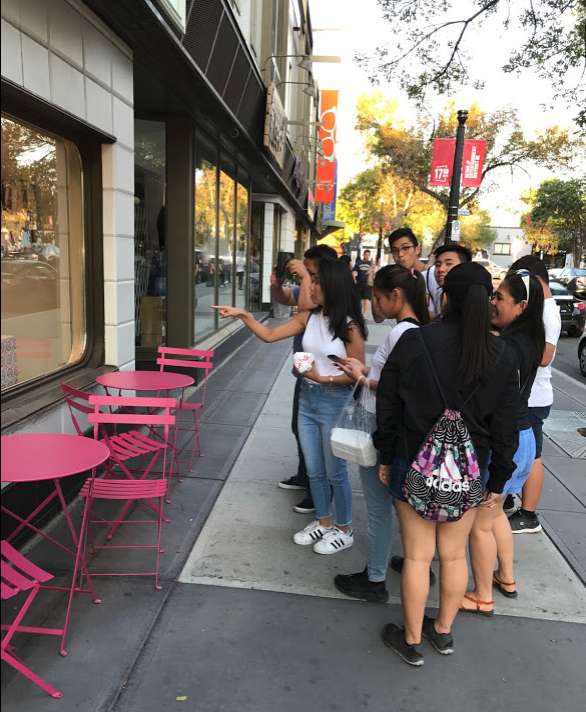 There is also a healthy independent café culture along the road with great names like Atomic Café, Heartwood Bakery and Café, Lucky Penny Coffee Co., Dilly Dally Coffee Café and Other Bean. And yes, a Starbucks and a Tim Horton’s too. Sweet Hereafter Cheesecakery’s décor is as rich and yummy as its cheesecakes (see photo). Open noon to 10 pm, it is cool a spot for a sweet afternoon delight or a nightcap. They offer a different selection of cheesecakes that very everyday. My choices when I was there were: maple pumpkin, autumn apple, apple pecan and banana bread. My pick - maple pumpkin – decadent and I was not disappointed! Sweet Hereafter Cheesecakery’s decor has a cheesecake richness. Quinpool is home to an array of ethnic restaurants. Even the Time Hortons seems to fit into the retro feel of Quinpool. Quinpool Road is unique in that while it is mostly small “mom and pop” shops, one block is dominated by large format stores - Canadian Tire, Atlantic Superstore and Nova Scotia Liquor Store. Fortunately, the stores have street entrances with all the surface parking in the back, offering the best of both worlds - walkable at the front, drivable at the back. I wish more developers and big box stores would do this as it makes for a much better streetscape. That being said, the facades of all three stores are due for an update - it could become a very funky block. The Atlantica Hotel Halifax, a 230-room four star hotel located at the east end of Quinpool Road adds another dimension to the mix. Every good street needs a hotel or two. The Canadian Tire and its sister big box stores provide the everyday needs of locals living near Quinpool. In addition to the Atlantic Superstore, Quinpool has several ethnic grocery stores and a major health food store. While Quinpool Road is currently surrounded mostly by modest homes, this is going to change. Like most urban streets in vibrant cities across North America, Quinpool is on the cusp of a mega-makeover. After 80 years, the art deco Oxford theatre closed in 2017 and was sold to a developer - a sure sign that change is in the wind for Quinpool Road. Other projects in the planning stages include the controversial The Willow Tree, a 25-floor residential building with street retail and the Drexel, an 15-floor mixed-use development. 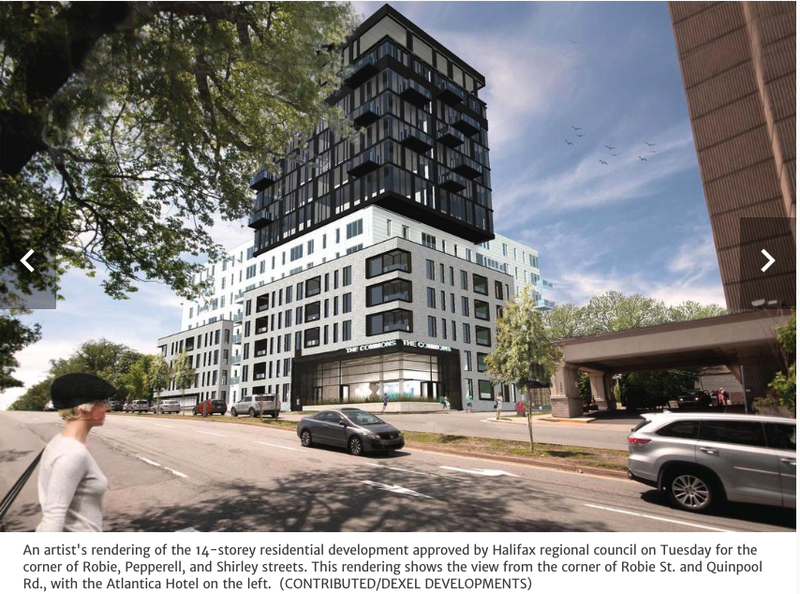 At Quinpool and Robie, plans are currently being finalized for an 18-floor condo tower on the site of the former Cruikshank’s Funeral Home, as well as an 11 and 22-floor residential tower next to it. The addition of these new mixed-use condos projects should benefit existing merchants as well as add new retailers, restauranteurs and entrepreneurs to the mix of existing shops. While I realize streets must evolve, I hope it does so gradually so it doesn’t lose the charm of its older homes and buildings too quickly. The cool mix of old and new, the chic and the shabby chic is an aesthetic worth keeping. When in Dubai many years ago, I was gobsmacked by the spectrum of balcony designs in its old town. 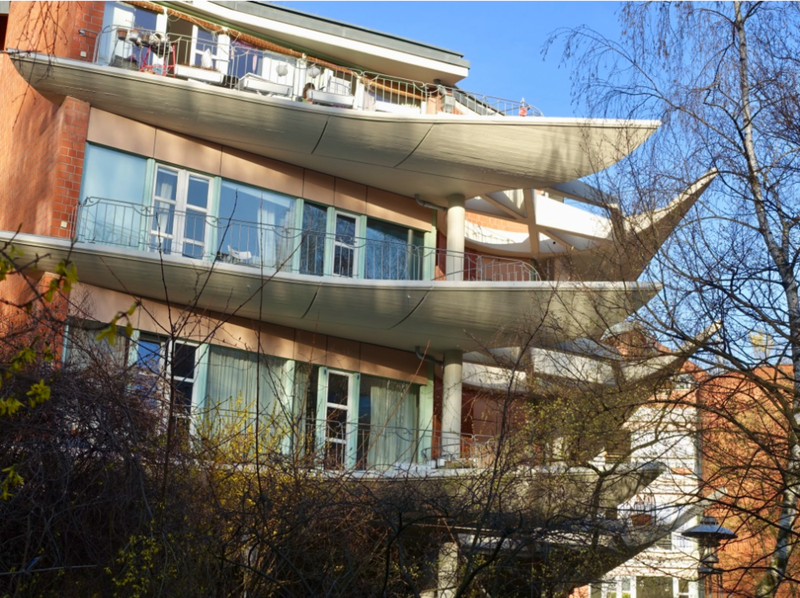 In fact, balconies were the signature design feature of the streetscape. 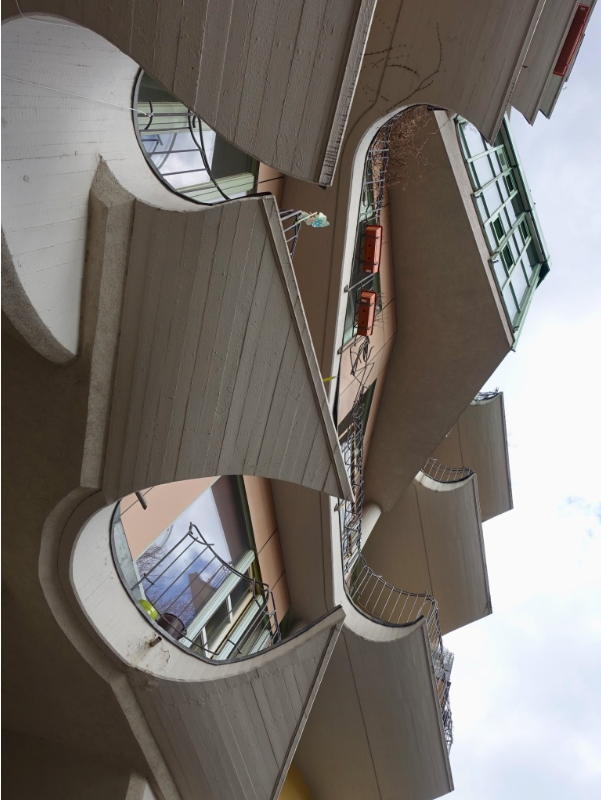 Since then, I have often taken photos of buildings with interesting balconies, but haven’t done anything with them, until recently when a colleague suggested it would be an interesting subject. So I gathered up some of my photos (unfortunately I don’t have any of the Dubai photos), did a little research and made balconies the subject of my November Condoscape column for Condo Living magazine. In theory, a balcony is like the front porch of a house, a place to sit and watch the world go by. It is an outdoor living/dining room where you can read, nap, chat, listen to music, browse on the laptop and even BBQ a gourmet meal. It can even be your outdoor office space for part of the year. Yet in reality, in Calgary it is often too windy or too cold to do the above very often. Or, if your balcony faces south or west, it can be too hot and too sunny to be out on the balcony. You can’t win! Many first-time condo owners think the balcony is their private space. 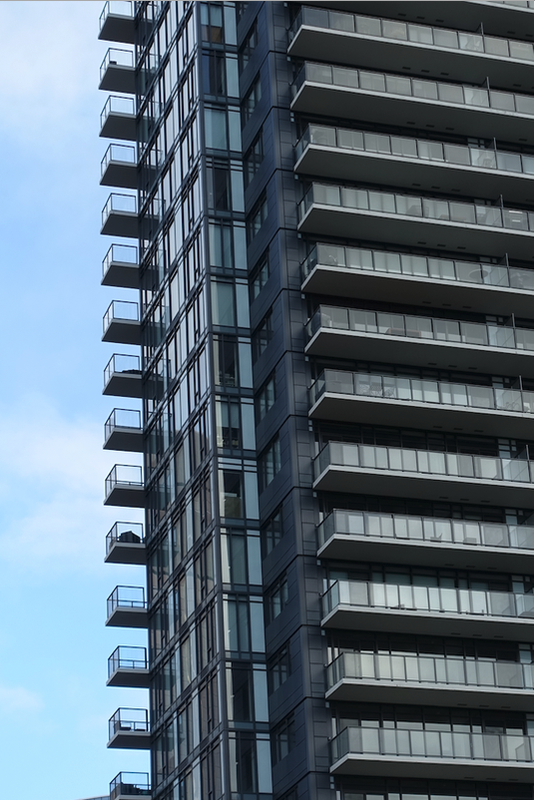 However, in most condos it is considered “common space” as it is maintained by the condo association, which means there are rules about what can and can’t be on the balcony. Read your condo bylaws. In Calgary, the balcony is not a place to hang your clean laundry, unlike in Europe where you often see clothes neatly hung out to dry, creating a charm to the streetscape – in my opinion. Something often lacking in our sterile North American urban landscapes. 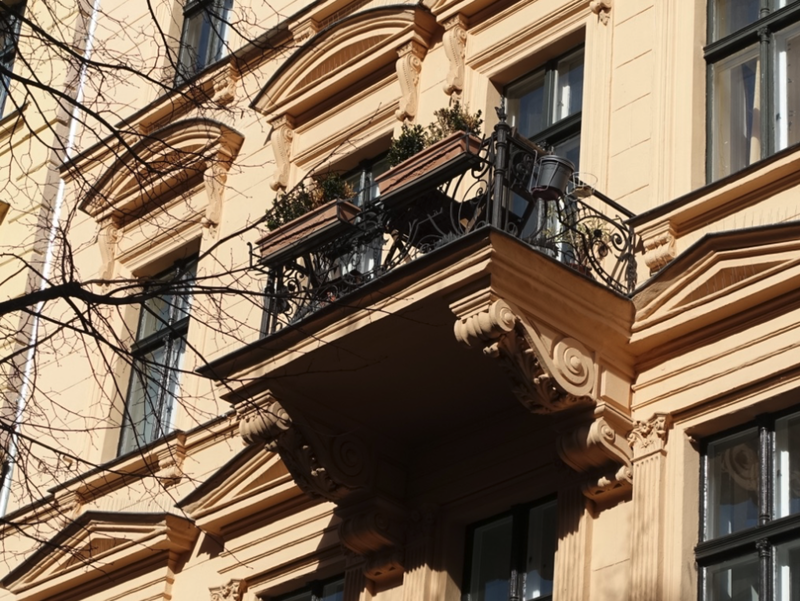 So, what makes for a good balcony? Not so deep as to prevent sunlight entering the apartment below. Large enough to comfortably accommodate least two chairs, small table and a BBQ. Screens and/or wall to filter sunlight and wind, as well as privacy. Located away from noisy equipment and garbage areas. 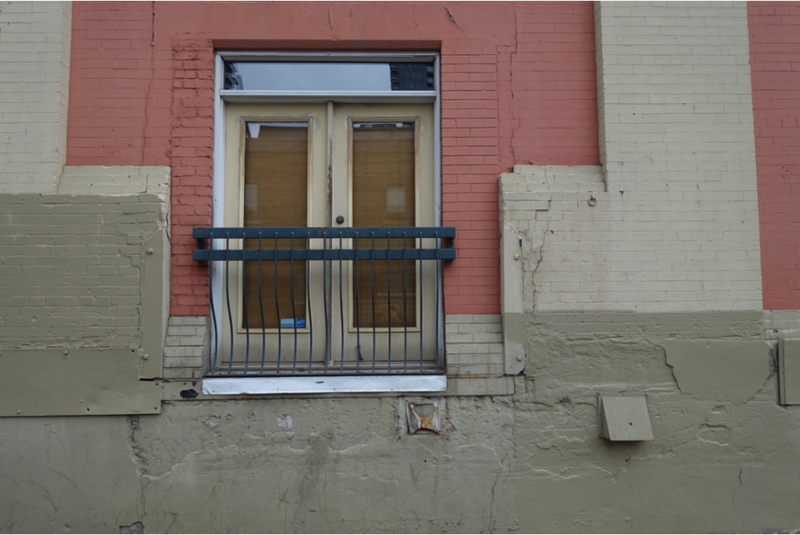 Balconies are a requirement in Calgary’s Land Use Bylaw. However, the City will relax this requirement if there are adequate equal common amenity area either inside or outside. Balconies can contribute to the safety of the street as the people on them are eyes on the street. 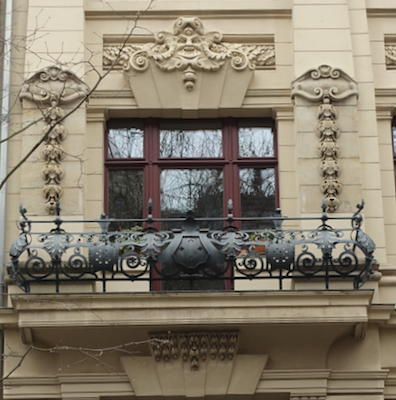 A recessed balcony is one that is set into the building’s façade, rather than jutting out from it. Some think recessed balconies are best because they provide better privacy and better protection from the weather. Some also like the sleek look they give the façade of the building. A cantilevered balcony hangs out over the side of the building, exposing it to the wind, rain and snow. 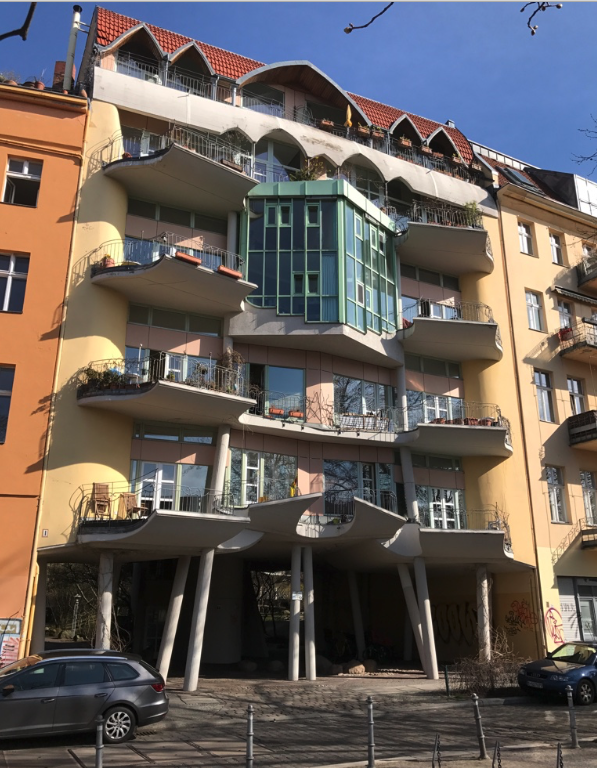 From round to square, rectangular to triangular, the shape and repetition of the balcony adds a texture and pattern, that contributes to the distinct aesthetic statement of the building. A Romeo & Juliet balcony is just railings attached to the outside of the building with in-swing doors or sliders. Look at any condo anytime and you rarely see anyone out on the balcony. So why do they have them? In a winter city, wouldn’t it make more sense to have that space inside the condo where it would be useable year-round? Apparently not. In chatting with a few condo dwellers, they all love their balconies, keeping heaters and blankets close by so they can use them as much as possible. Several architects and developers indicated large balconies are a big selling feature, helping to differentiate one condo project from another. Although, I was also told shared roof-top patios are quickly becoming the “in-thing” for outdoor living of condo dwellers. Is Calgary going to the dogs? For a long time now, I have been telling developers (both urban and suburban) they should create more amenities for dog owners. Finally, it looks like they are listening! In fact, it might be said Calgary is “going to the dogs,” but in a good way. 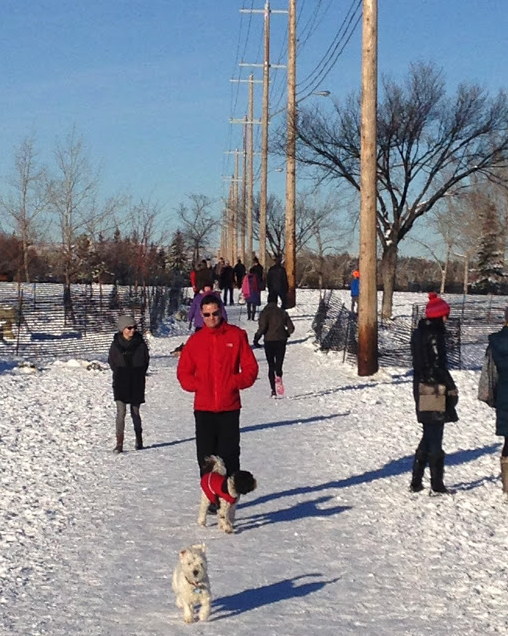 I have said it before and I am saying it again, Calgary is "Dog Park capital of North America!" If you love dogs, you will love this blog! 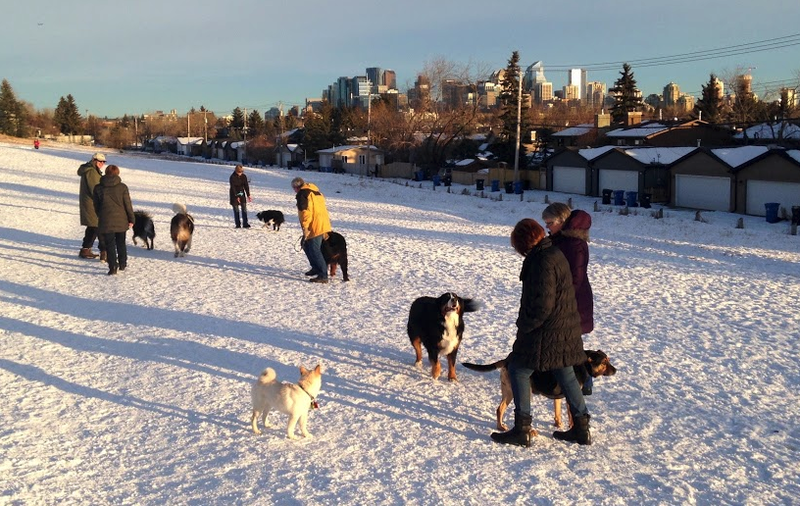 Calgary has over 100 off-leash areas scattered across the city. However, there there is a void of dog parks in the City Centre, but that could be changing soon. It seems everywhere I go and everybody I talk to these days is telling me about how developers are adding dog-friendly elements to their communities. Recently, University District opened their North Park which features a small fenced off dog park area. What I love most about this is that the dog park has been completed before anyone even moves into University District. And it is proving to be popular with those living in nearby Montgomery, Varsity and University Heights. Hmmm…is this a clever sales strategy? And, Bruce McKenzie, Vice President, Business Development, NORR Architects Engineers Planners tells me they have designed for a developer a large luxury condo project in Mission that will include its own dog park. And the multi-use rooftop at Minto Communities’ Annex project in Kensington, designed by Nyhoff Architecture will include dog run. How cool is that? East Village has embraced dogs also, opening up a temporary fenced-in dog park on a little triangular piece of land across from Ron Moppett’s mural made up of 950,000 colourful tiles. I am thinking they need to find a site for a permanent dog park given the Village will eventually be home to 10,000+ people. With Calgary currently having about one dog for every 10 people, that could be a lot of dogs living in East Village when fully built out. The Beltline learned about the importance of dog parks a few years ago so they renovated Connaught Park 2015 to include a fenced-off dog park. It has since become one of the community’s most popular hangout places. Too bad they didn’t make the new East Victoria Park a dog park - I rarely see anyone in the park along Macleod Trail. I bet if they converted it to a dog park, it would have people (and dogs) there all the time. The Annex's model shows a roof-top dog run, I am thinking this is a first in Calgary. Connaught Park has a fenced in dog park is a popular place for those living in the Beltline to hang out with friends - human and canine. The new temporary dog park in East Village occupies a small piece of unused grass. Dog parks can utilize spaces that are difficult to develop. Why I love dog parks? Full disclosure – I don’t own a dog and never have in my adult life. But I do dog sat regularly for friends in Altadore. That means trips to River Park twice, sometimes three times a day. What impresses me most about River Park is how devoted many dog owners are to walking their dog and how social the experience is for both the owners and the dogs. I have seen dozens of people walking their dogs in blizzard conditions. One night at -30 degrees, there was a dog walking group out walking. That’s dedication! What I love about dog parks is that they are used seven days a week, morning, noon and night, 12 months of the year. I am not sure any of Calgary’s other 5,200 parks can claim that - most only get used seasonally. I also enjoy the fact that not only do the dogs come in all shapes and sizes but dog parks are full of people from all walks of life. I often see young families and small groups of retirees out walking their dogs and chatting with each other, as well as individuals. Almost always they will smile and say “Hi” and in some cases we strike up a conversation. When urbanists talk about creating inclusive gathering places – nothing beats a dog park. River Park in the summer is a busy place from sunrise to sunset. The dog park will cater to people of all ages and backgrounds and it will be used year-round. It will be the most important community building amenities in the new community. I hope Parks will get their head out of the sand and let Josh build his dog park. In my opinion, we should be insisting all new communities and major condos include a dog park or dog run. West Hillhurst dog park offers great views of the City's skyline, as well as a chance to chat with friends and neighbours. Yes, I do make a point of researching and visiting dog parks when I am visiting others cities. I have seen some amazing ones in Las Vegas, Palm Springs and some pretty ugly ones in places like Berlin. But I have never seen anything to match Calgary’s River Park or upper Edworthy Park for their size, varied terrain and spectacular views. An edited version of this blog appeared in the Calgary Herald's New Condo section August 26, 2018. Public Art: Rocks? Keys? Dog & Bone? Bow River Promenade vs Downtown Penetrator? 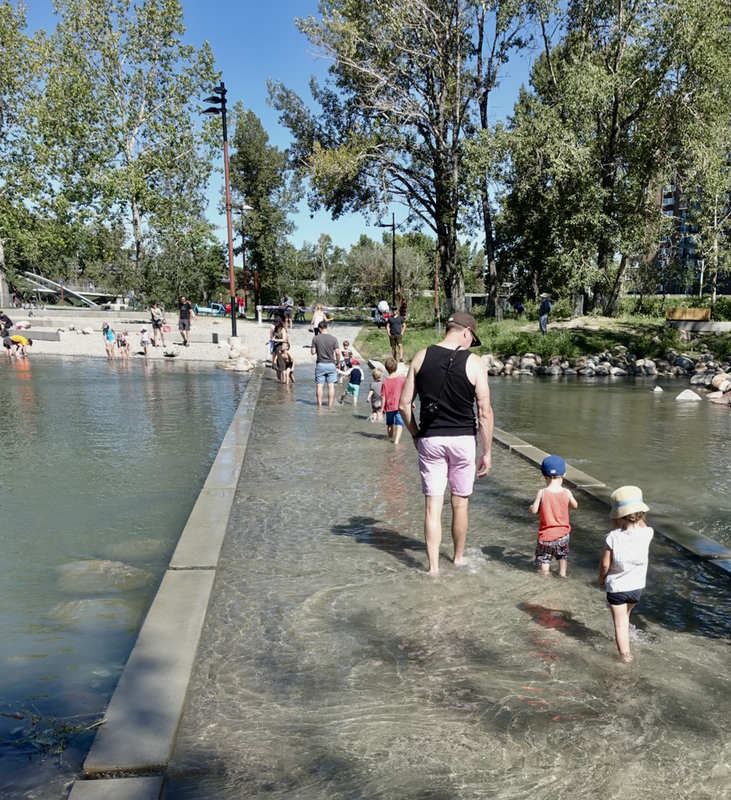 With the completion of the West Eau Claire Park, Calgary now has one of the best urban river shorelines in North America, perhaps even the world. The new West Eau Claire Park is creating a special place to sit and linger along the Bow River Promenade. What’s so special about the Bow River as it passes through the City Centre (Edworthy Park to Harvie Passage) is that it is still more or less natural - no concrete, canal-like retaining walls; no theme-park bars and restaurants lining the shore. You can still walk to the river, throw stones, dip your toes in, go fishing, launch a small water craft or even river surf. The Bow River is one of Calgary’s key urban differentiators. Looking east along the Bow River pathway at the entrance into downtown. The Princeton's interface with the Bow River Promenade creates a lovely garden setting for both residents and those using the promenade. This is how public/private spaces should look like. 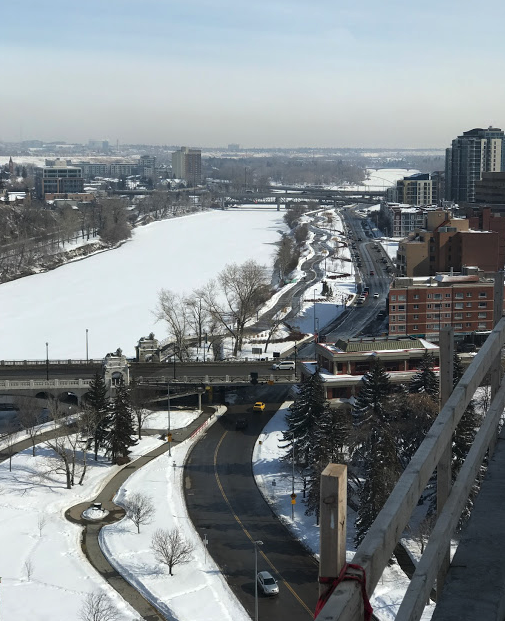 Over the past two decades, the City of Calgary has invested over 100 million dollars to create a pedestrian-friendly urban edge to the Bow River – complete with parks, plazas, promenades, pathways, public art and bridges. Today, it has ten bridges including three signature ones - the historic Centre Street Bridge, Peace Bridge and King Bridge. It also links to several parks – Prince’s Island, St. Patrick’s Island, Fort Calgary, Sien Lok, Shaw Millennium and Nat Christie. Perhaps it is time to come up with a unifying name for the 4+ km south shore public spaces - at present, it has a collage of names. In East Village segment is officially called the Jack & Jean Leslie RiverWalk, most people know it simply as RiverWalk. From Chinatown to just past Eau Claire Market, it becomes the Bow River Pathway and then changes to West Eau Claire Park for the section west of St. Patrick’s Island at the base of the Peace Bridge till the 10th Street bridge where it becomes Bow River pathway again until you get to the Nat Christie Park just east of the 14th Street bridge. Bow River Promenade snakes its way from Centre Street bridge to East Village. It is kept clear of snow in the winter, making it a popular public space year round. In the summer it is a poplar place for people of all ages and background. It has become a very popular place for those floating the Bow River to take out their rafts. There are numerous spot so sit and linger along the promenade. It has a very vibrant c Canada goose community. New residential developments next to Sien Lock Park create an attractive link between Chinatown and the Bow River. New condos in East Village with dog park in the foreground are converting what was once a mega parking lot for downtown workers into an attractive new urban neighbourhood. From both a local and tourist perspective, the entire pathway should have one name. I don’t suggest RiverWalk as it would be seen as if we are trying to imitate San Antonio’s famous River Walk – nothing could be further from the truth. What about Bow River Promenade? Bow River Stroll? Bow River Parade? Maybe even Bow River Loop (as you can loop back along the north shore and take in Poppy Plaza and get a better view of the Calgary’s ever-changing downtown skyline which is quickly becoming dominated by new condo towers)? As a result of all the public improvements, the Bow River’s south shore has become a mecca for urban living. Since the mid ‘90s, new condos on or near the Bow River have been completed every few years creating an interesting urban design history lesson. Eau Claire 500's is an example of poor urban design as it turns it back onto the public space and allows for no interaction. 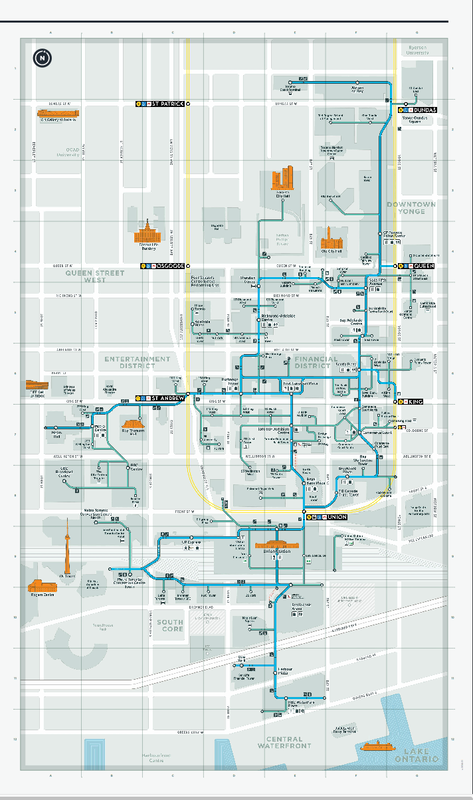 The earliest is Eau Claire 500, the two, dark brown brick buildings designed with the enclosed courtyard and completed in 1983 by SOM, one of the world’s most renowned architectural firms. The complex literally turns its back to the pathway and river - no townhomes face the promenade, just a blank wall. This would never happen today. Neither would the River Run townhome condos completed in 1995 behind Eau Claire Market with no set-back from the promenade. At that time, the City was desperate to see some residential development in downtown so they approved this low-density project that looks like it has been imported from the suburbs. River Run complex was part of the failed Eau Claire Market urban revitalization project. A new mega redevelopment plan is currently in the works. 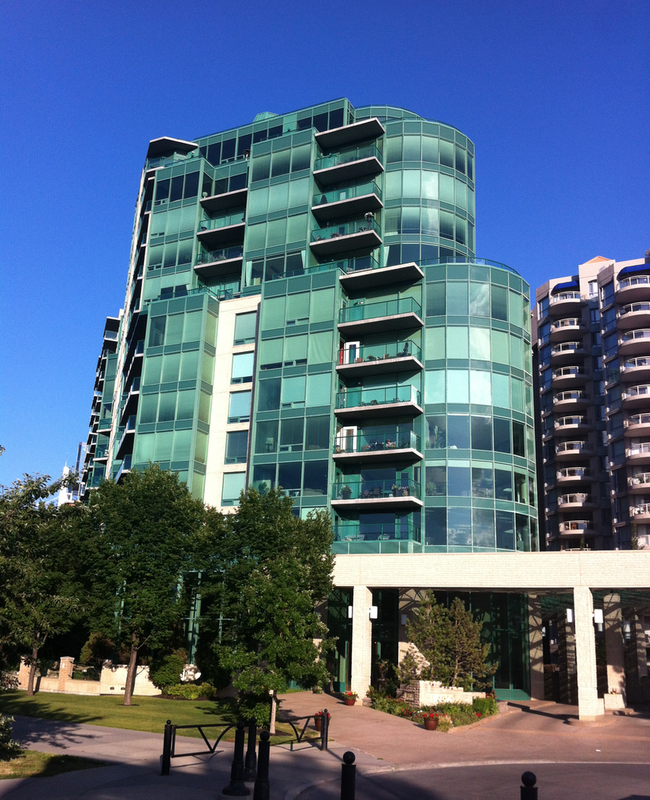 Late 20th century residential development in West Downtown neighbourhood is located on the edge of Bow River Promenade. 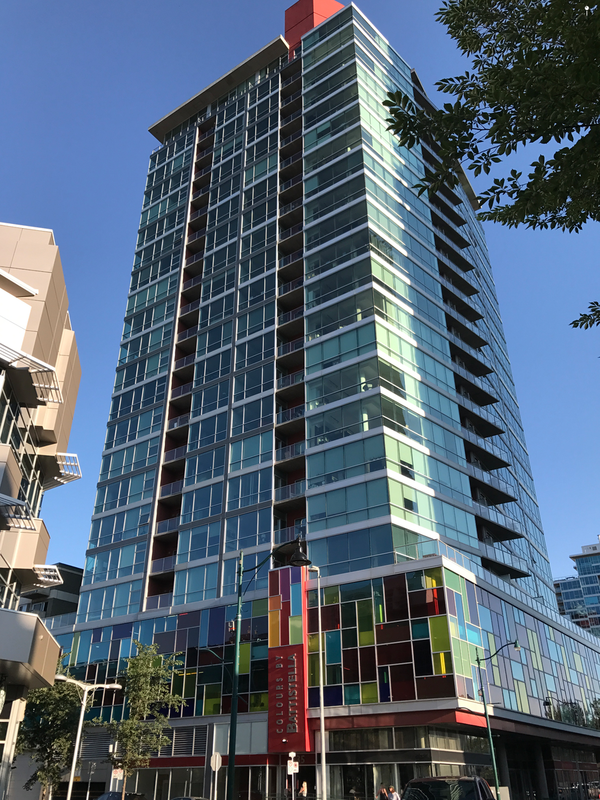 The 21st century has seen the completion of the two Princeton towers on Riverfront Avenue with low rise buildings facing the promenade (which minimize shadowing on the promenade and park) with its timeless red brick façade and sandstone coloured accents. 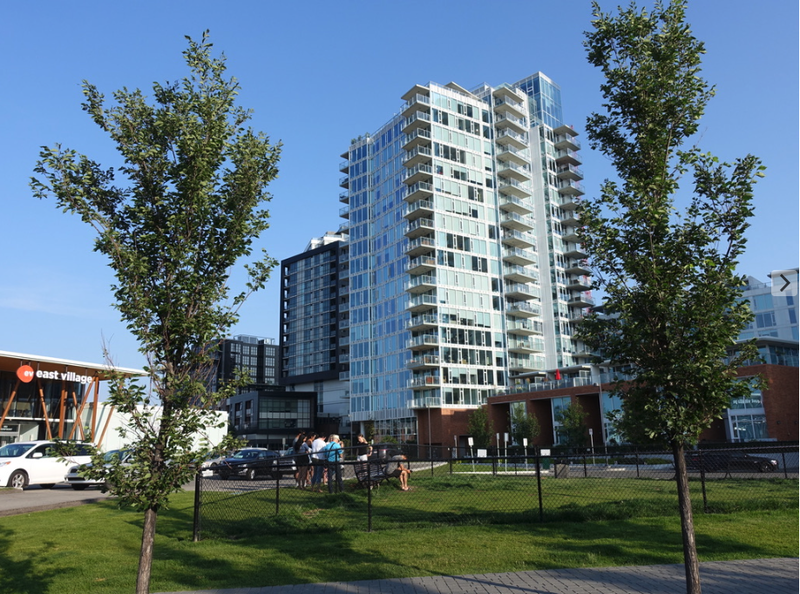 East Village is home to several contemporary condos facing St. Patrick’s Island Park. The Princeton's (left) early 21st century design creates a sharp contrast to the '80s design of Eau Claire 500 (right). The two newest condos are the Concord at the Peace Bridge and the Waterfront at Sien Lok Park, both with glass facades that step-down to the river to maximize views of the river, pathway and downtown. Anthem Properties’ ambitious Waterfront project is the biggest condo project in Calgary’s history with 1000 homes in ten different buildings. Today, the Bow River’s south shore is one of Calgary’s most desirable places to live and one of North America’s best examples of the 21st century urban living renaissance. The Bow River Promenade is not only home to luxury condos but also a mega homeless shelter that some have nicknames the Hilton Homeless Shelter for its high quality design and materials. 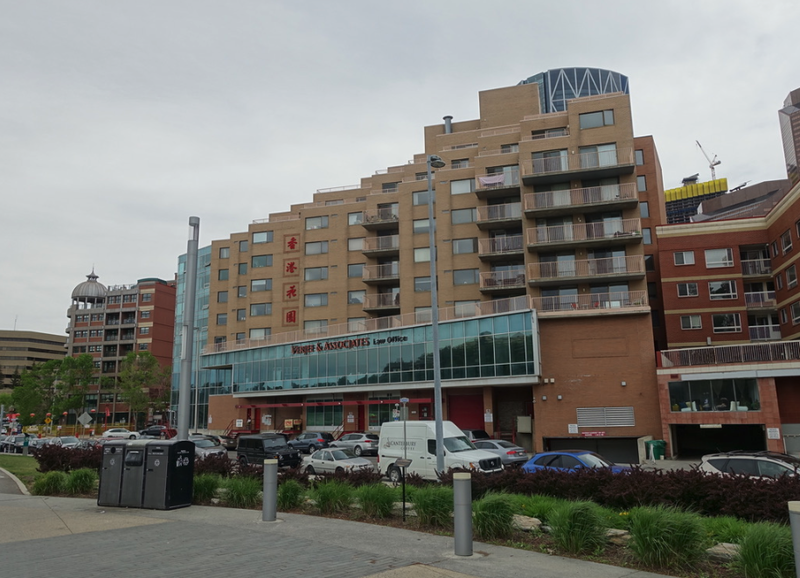 Chinatown offers some affordable condos along the RiverWalk. The postwar oil boom resulted in hordes of head offices moving to Calgary which led to a huge increase in traffic into the downtown. By the early ‘60s, civic leaders felt part of the problem was that downtown was hemmed in by the Bow River to the north and the Canadian Pacific Railway tracks to the south so they pitched the idea of moving the CPR tracks to the river so downtown could spread out into what is now the Beltline. However, by 1964, City Council killed the relocation of the rail lines amid bickering and cost issues and came up with a new Downtown Plan. 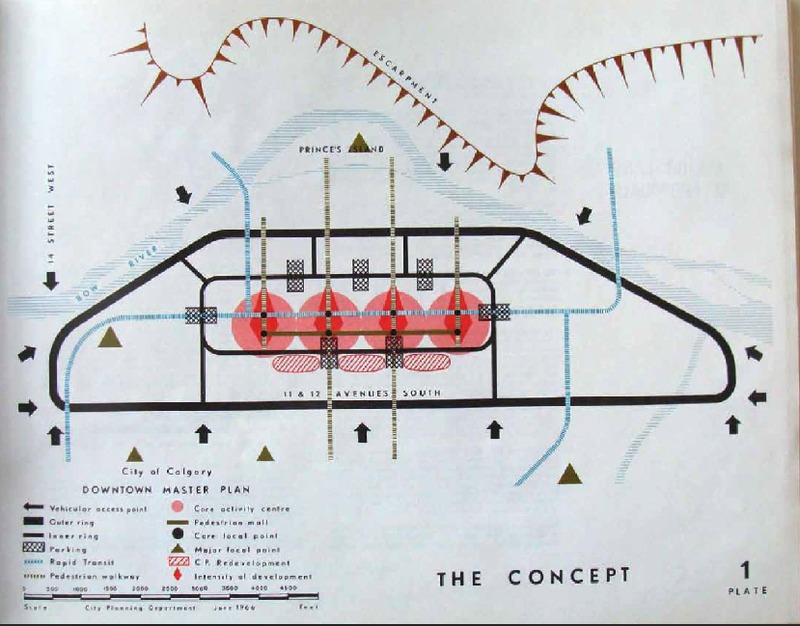 Illustration from 1964 Downtown Master Plan. 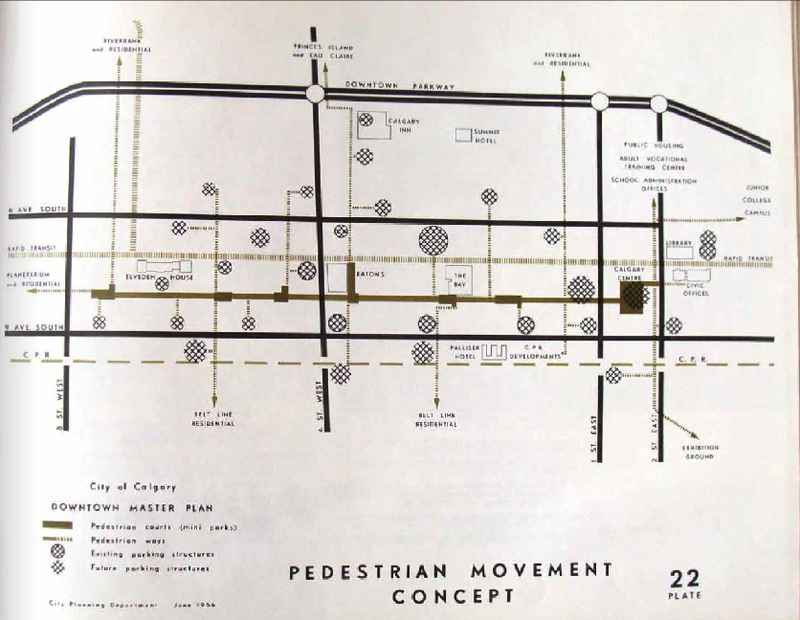 Then in 1968, a transportation study called for several new Calgary highways - Crowchild Trail, Blackfoot Trail, 14th Street West freeway, Anderson Trail, and the Downtown Penetrator (Yes, that was the name!). 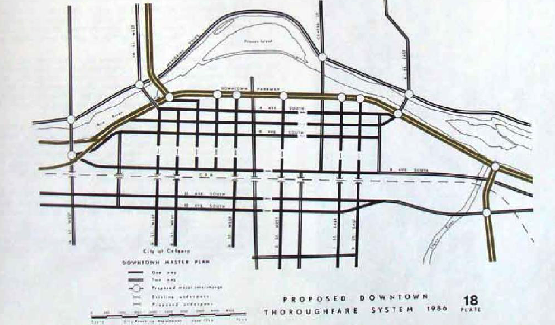 The Downtown Penetrator was a proposed major freeway that would have extended from Sarcee Trail into the downtown along what is now 2nd and 3rdAvenues SW. The plan called for demolishing 400 homes, many in low-income areas that were considered skid rows. The Centre Street, Louise and Langevin (now Reconciliation) bridges would have been replaced with new bridges. Chinatown would have been relocated and much of East Village, (called Churchill Park then), would have been destroyed. Fortunately, the Downtown Penetrator died as a result of public protest (especially from Chinatown) creating the opportunity to rethink our connection to the Bow River. Many developers and urban planners in the late ‘80s and early ‘90s said downtown residential would never happen in Calgary. It was a time when the single-family reigned and most Calgarians turned their noses up at the idea of communal condo living. Calgary’s corporate executives lived in houses along the Elbow River in Roxboro or “on the hill” (aka Mount Royal), not along the Bow River. Eau Claire, Chinatown and East Village were mostly old homes, skid rows and a prostitute stroll. Eau Claire 500 sat alone for almost 15 years before another condo tower joined it. It is amazing what can happen over a few decades. The Bow River, its islands and riverbank have gone from a neglected jewel in the ‘70s to a vibrant urban playground in the ‘10s. I can see the promenade extending all the way from Edworthy Park to Harvie Passage in the future. It’s time to give our unique collection of urban public spaces along the Bow River a meaningful and memorable name! In addition to promenade, stroll and loop, perhaps the Makhabn Passage (Makhabn being the Blackfoot name for the Bow River) might be an appropriate name? Urban Sprawl: Who wants to live way out here? I really do need to get out more. Specifically, to the edges of the city, to see what is happening in Calgary’s new frontier. Recently, I was reminded of this when driving some buddies (inner-city boys) out for a round at Canals of Delacour golf course, which meant we had to drive past the airport. Who does that? He smiled and sheepishly admitted that when he moved to Charleswood in the early ‘60s, it too was treeless, there was no University of Calgary, no Brentwood Mall or LRT station and indeed, people asked him “Why do you want to live so far out?” The other buddy agreed that it was the same for him when he moved to Calgary 40+ years ago and chose to live in Beddington before moving to the inner-city. When I pointed out people living in these new northeast communities have easy access to Stoney Trail, the airport, CrossIron Mills (shopping and cinema), Lowe’s Home Improvement and the New Horizon shopping centre opening this summer – and of course, Costco. I then hit them with buddy’s motto “If Costco doesn’t have it, I don’t need it,” which resulted in agreement all around. I also reminded them that with the popularity of online shopping for groceries, clothing, electronics and other everyday needs, having stores nearby isn’t as important as it once was. Both admitted living out here might not be that bad after all and that getting a bigger home by living further from downtown was one of the reasons they chose to live on the edge of the city when they moved to Calgary and had young families. One even said, “who needs to live near downtown. I never go there anyway.” Ouch! However, what is different about these new suburbs, compared with those 40 or 50 years ago is they are not a sea of single-family homes on huge lots, but a diversity of housing options including, single-family homes, duplexes, row houses and mid-rise condos (4 to 6 storeys high). Two days later, when heading out to play another round at Canal at Delacour, (yes, I love the course) I decided to leave early to explore these new communities and see for myself what was happening. I was gobsmacked by Truman’s Orchard Sky project with its cluster of seven condo buildings totalling 423 new homes within walking distance of a school, park and pathway in the new community called Skyview Ranch. I also saw what looked to be a large, 6 storey wood frame residential building nearby, as well as other four-story residential buildings along the main corridor. While it might not be the Beltline or East Village, it is certainly not the low-density suburbs of the mid to late 20th century. It can all get a bit confusing when you read the marketing information and learn there is a new community in the northeast called Savanna that is actually in the community of Saddle Ridge. Or, when there is both a Cornerstone and Cornerbrook community in the northeast. I think one might be within the boundaries of the other, but it wasn’t clear. As if the naming of the streets wasn’t confusing enough with all of the street names looking the same, now the community names also overlap. It is not only at the northeast edge that Calgary’s condo invasion is happening. It is also in the southwest, southeast, west side and directly north up Centre Street. A quick check with the City of Calgary and there are currently 23 condo construction sites in new communities creating 2,693 new homes for Calgarians. Condo living is not only just starter home for young Calgarians in the suburbs. It is a lifestyle option for people of all ages and backgrounds in in the 21st century. Note: An edited version of this blog was published in the July 2018 edition of Condo Living Magazine. 80% of Calgarians must live in the suburbs! Everyday Tourist's Road Trip to the 'burbs! Calgary: At The Forefront Of North America's Urban Densification Revolution? The Bridges is master-planned community created a new heart for Bridgeland/Riverside one of Calgary's oldest communities. It has become a haven for young families with its access to major parks, schools, downtown and its own main street. First there was The Bridges on the old General Hospital site in Bridgeland/Riverside in 2005, followed by the development of East Village, where its first condo was completed in 2015. Both projects were City of Calgary-led initiatives and both are in the City Centre. 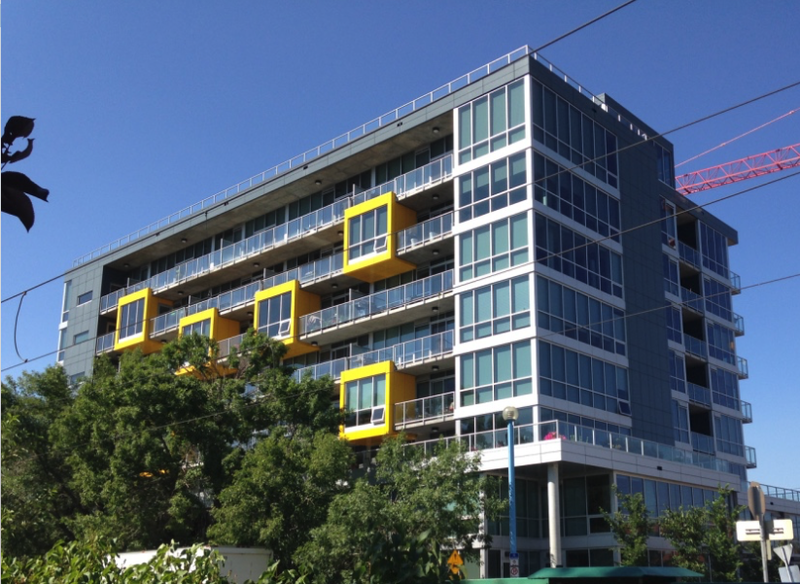 The N3 condo in East Village built with not parking sold out in a weekend. It is part of the mega makeover of East Village that will become home for 12,000 people by 2025. Today, there are three master-planned, urban villages (low, mid and high rise condos) reshaping Calgary’s older suburbs – Currie by Canada Lands Corporation (CLC) on the old Canadian Forces Base: University District by West Campus Development Trust on vacant University of Calgary lands; and West District by Truman Homes on the western edge of the city ,in the community of Wentworth. What is a master-planned urban village? It is a community with a comprehensive land use plan that focuses on predominately mixed-use, multi-family buildings with significant office, retail, restaurant, recreational and other uses where most of the residents’ everyday needs are within walking distance. They also offer accessibility to enhanced transit, bike lanes, multi-use pathways and a central park. Urban villages are often part of, or next to, a major employment centre allowing residents to walk, cycle or take transit to work. 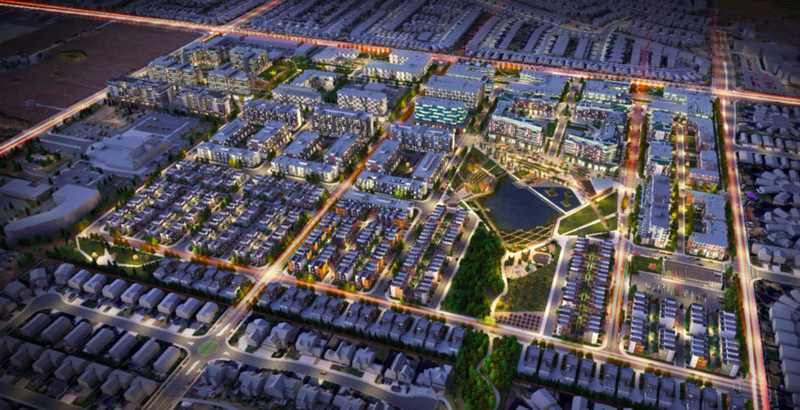 Currie, a 400-acre mega infill project that includes Garrison Woods and Garrison Green, will transform the historic Canada Forces Base that straddled Crowchild Trail at Richard Road/Flanders Avenue into a city within a city. 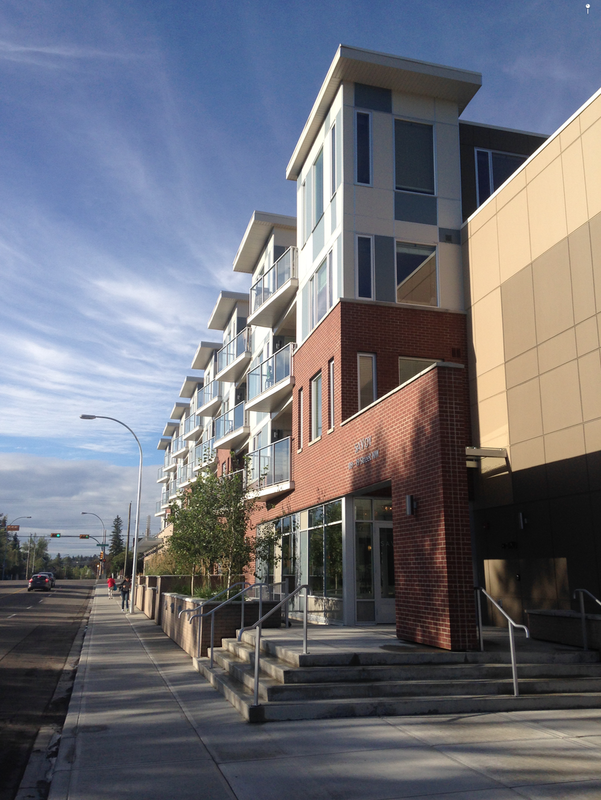 Currie is within walking distance to Mount Royal University and Lincoln Park Business campus. Ultimately, the SW BRT and several existing bus routes will provide residents with several transit options. Cyclists will enjoy the Quesnay Wood Drive dedicated cycle lanes. A strategic partnership between CLC and Embassy Bosa will see the later build approximately 2,500 condo homes and the majority of Currie’s retail in 2019. Currie received the Charter Award for Neighbourhood, District and Corridor by the Chicago-based Congress of New Urbanism for its application of new urbanism principles. Artist's rendering of one of the 15 mews that will make Currie a pedestrian paradise. Artist's rendering of Currie's Main Street. University District (UD) is a new inner-city community surrounding the Alberta Children’s Hospital. Unlike other master-planned communities where the land is sold to developers who then build the homes, UD land will be developed based on a 99-year prepaid land lease, based on the successful UBC Properties Trust model in Vancouver. UD’s townhomes and mid-rise residential buildings, will be designed to appeal to families, seniors, young professionals and empty nesters. Already under construction are townhomes by Brookfield (Ivy) and Truman (Noble). 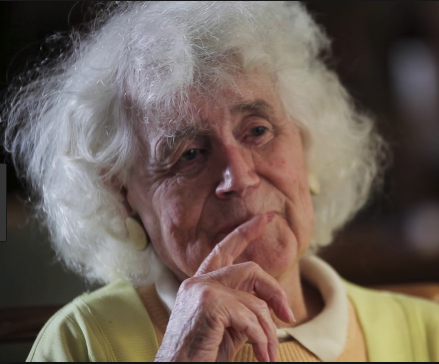 Construction begins later this year on Truman’s Maple condo for independent seniors’ living and Brenda Strafford Foundation’s Cambridge Manor, an assisted living and long-term care facility. As well, Avi Urban launched its August condo project in March. Just over 1,000 residential units will be under construction by fall of 2018, with the first residents moving in beginning late 2018. 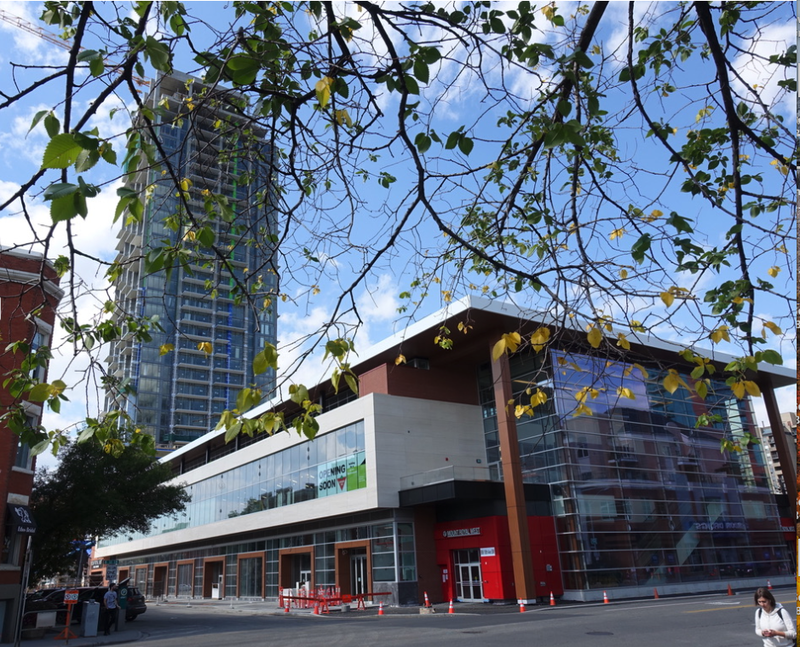 Also under construction is Gracorp’s Rhapsody, a six-storey mixed-use building with a Save-On-Foods grocery store on the main level and residential above. 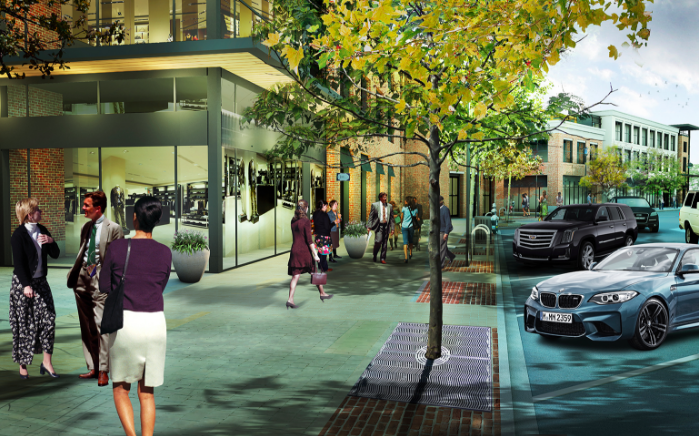 Rhapsody will anchor the nine-block main street designed to create a “Kensington-like” pedestrian experience. University District will become the heart and soul of Calgary’s second largest employment hub that includes University of Calgary, Foothills Medical Centre, Alberta Children’s’ Hospital, Market Mall and University Research Park. UD is a LEED ND Platinum certified community, the first in Alberta and the largest in Canada. 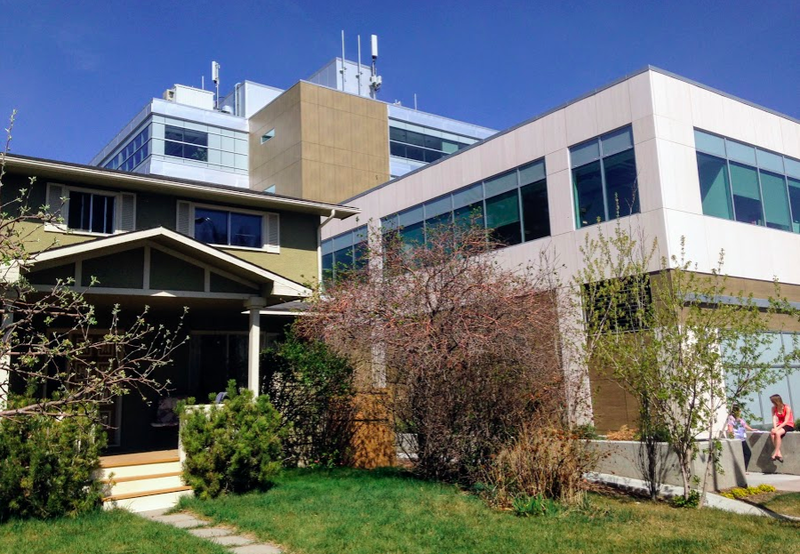 While Currie and University District have government affiliations, West District is a legacy project for Truman Homes a private Calgary developer. The inspiration for West District was the human-scale, walkable neighbourhoods of Portland’s Pearl District and Vancouver’s False Creek. West District will be a mid-rise community with a diversity of mixed-use residential and commercial buildings from 6 to 9 storeys (aka human scale.) Led by Calgary’s CivicWorks Planning + Design, it will be a model for “smarter growth” showcasing how walkable, dense and diverse communities can be achieved without high rises. The 7-block long main street, will not only integrate shops, bistros and cafes, with office, financial, recreation and medical hubs, but also enhanced sidewalks and a dedicated bike lane to maximize pedestrian and cycling accessibility. Central Park, its 8-acre public space will include a 500-seat amphitheater, skate park, skating rink, spray park, basketball court, playground, dog park and a large amenity/event building will be a year-round, all ages urban playground. West District won Calgary’s 2015 Mayor’s Urban Design Award for City Edge Development. West District's Central Park also features a major water feature. West District's skate park and basketball courts is part of Central Park. Model of West District "main street" with retail at ground level and separate cycling lanes in the West District sales centre. 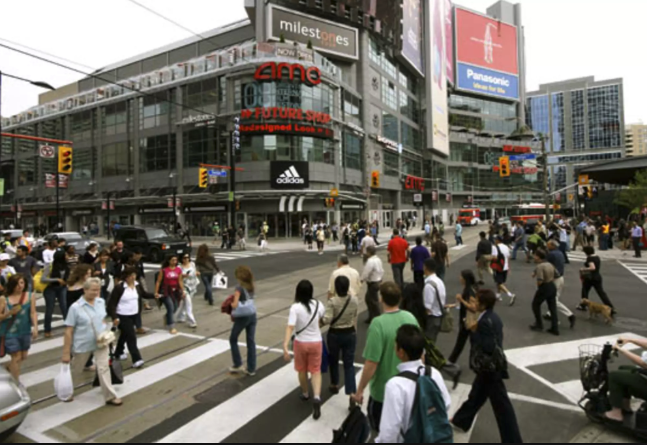 The biggest challenge facing North American cities today is how to reshape their older residential dominated, auto-centric suburbs into mixed-use, multi-modal (driving, transit, cycling and walking) 21st century communities. In November 2017, I blogged about why I think Calgary is the infill capital of North America when it comes to inner-city single-family, duplex and row housing. Currie, University District, West District and their two forerunners - East Village and The Bridges, as well as projects like Quarry Park, SETON, Medicine Hill and Greenwich - put Calgary at the forefront of North America’s current urban densification revolution. SETON by Brookfield Residential is a mega new 300-acre urban centre under construction at the southeast edge of Calgary. It will include 1.5M sf of office space, 1M sf of retail, 6,000 to 7,000 new home (towns and condos), South Health Campus, high school and largest YMCA in the world. Trinity Hills at Canada Olympic Park by Trinity includes 670,000sf retail, 125,000sf office and 2,355 homes (towns and condos) is currently under construction. Greenwich by Melcor is under construction across the street from Medicine Hill. It includes 200,000sf office, 120,000sf of retail and 1,200 townhomes and low-rise condos. Note: An edited version of this blog was published in the Calgary Herald's May 2018 edition of Condo Xtra. Downtown Calgary ‘flies under the radar” for most Calgarians when is comes to being a place to live. However, that is not true for the 9,000 people who live in what the City of Calgary calls the “Downtown Commercial Core” (i.e. from 3rd St SE to 9th St SW and from 9th Ave to 4th Ave SW.
Anthem Properties' Waterfront project one of several new luxury condo projects built over the past 10+ years in downtown Calgary along the south shore of the Bow River. It doesn't get any nicer than strolling along the Eau Claire Promenade which is part of the Bow River Pathway that extends on both side of the river from one end of downtown to the other. While the Beltline, Bridgeland, Inglewood and Kensington get all the attention as Calgary’s urban living hot spots, when you combine Downtown West End, Commercial Core, Downtown East Village (the City’s official names for these three communities), Eau Claire and Chinatown (together they are roughly the same geographical size as the Beltline) there are over 18,000 people living downtown vs. Beltline’s 21,357 and Hillhurst/Sunnyside’s 10,345). 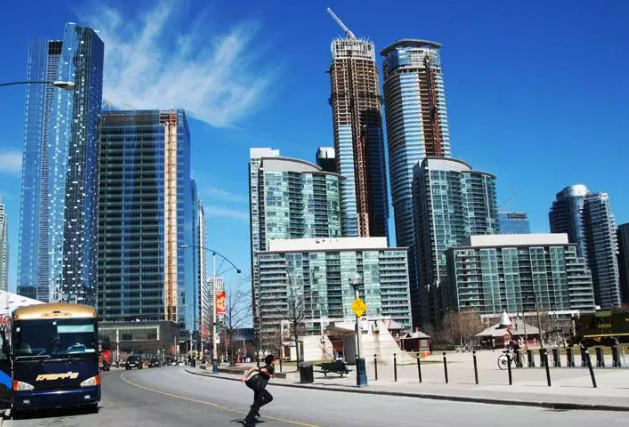 While downtown's shiny office towers get all the attention – good and bad – downtown (using the broader boundaries) is definitely a cool place to live. Olympic Plaza is a great spot to sit and watch the world go by or chat with a friend. Downtown has some amazing public spaces. Hotchkiss Gardens is also a fun place to sit and chat with friends. 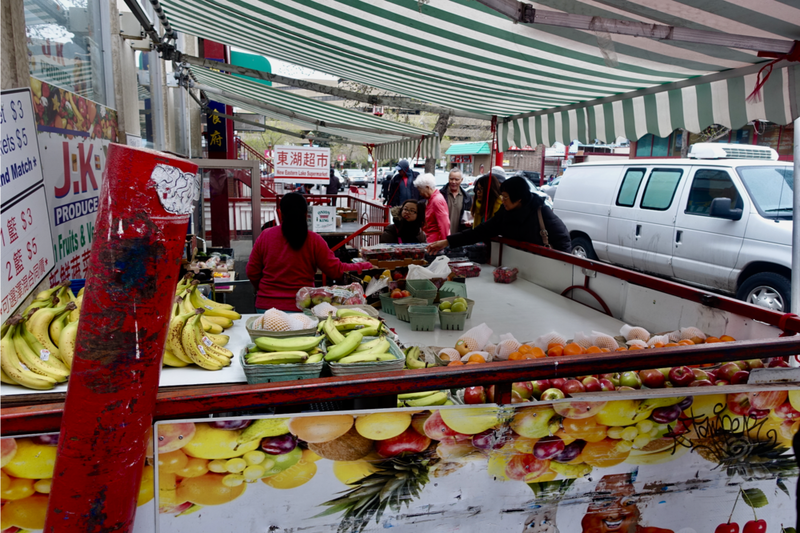 Chinatown is a fun place to shop for groceries. Shaw Millennium Park provides not only a unique view of downtown, but also unique recreational and entertainment experiences. There is a festival or major event in downtown almost every weekend. Everything from the High Performance Rodeo to major international festivals (Children, Film, Folk and SLED) Downtown also hosts Calgary’s largest single day event - The Calgary Stampede Parade the first Friday every July. Major outdoor concerts and music festivals also happen at Shaw Millennium Park and Fort Calgary Park every summer. 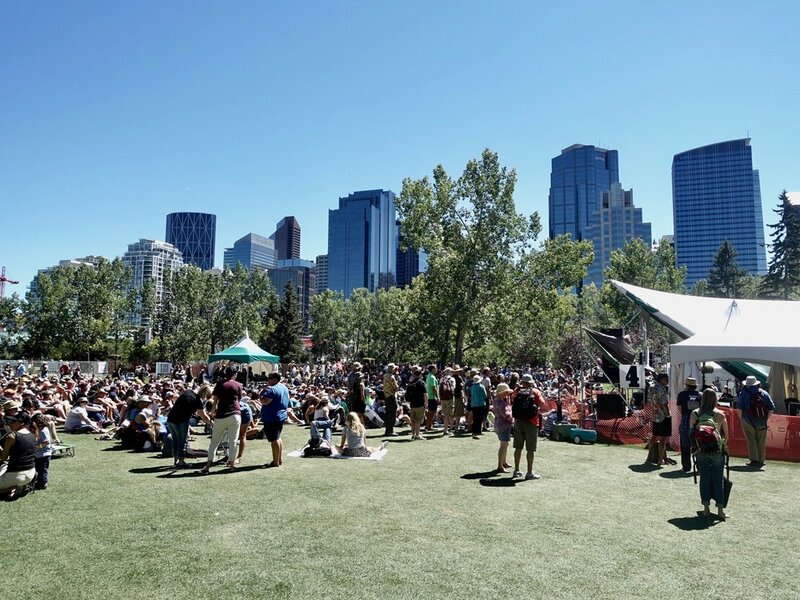 The Calgary International Folk Festival is just one of the many festivals that take place on Prince's Island. 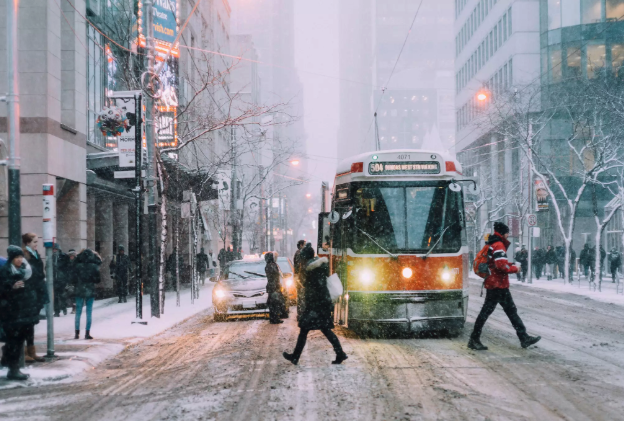 An amazing diversity of shopping opportunities exists in Downtown – department stores (Hudson’s Bay, Simons and Holt Renfrew) to the uber chic Core and grassroots Chinatown. In addition there are shop at Bankers Hall, Scotia Centre and Bow Valley Square. Calgary’s downtown shopping not only surpasses anything Portland, Nashville or Austin have, but also rivals Calgary’s Chinook Centre (one of Canada’s top malls). There are also off-the-beaten path shops like Map World with its incredible collection of wall maps, globes, travel and topographical maps. Or, if you are into fly-fishing, Hanson’s Fishing Outfitters in the Grain Exchange building has everything you might need. Bonus: you can walk from Hanson’s to fish in the Bow River in just a few minutes. How cool is that? 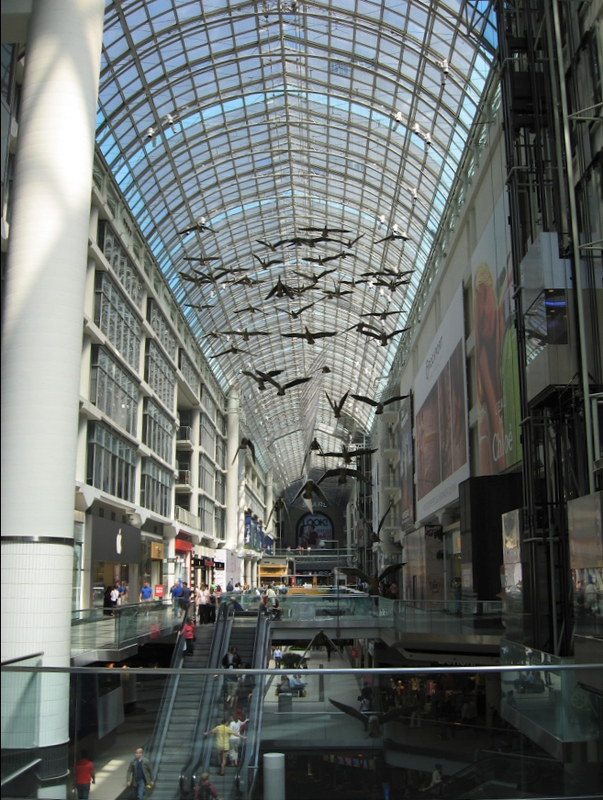 The Core is an amazing shopping experience with 3 floors of shops, 4th floor food court and links to shopping at Holt Renfrew, Hudson's Bay, Simons and Bankers Hall. Imagine having this in your backyard! Holt Renfew offers an upscale shopping experience. Power hour on Stephen Avenue Walk. Downtown Calgary is blessed with an amazing array of coffeehouses. Alforno Café and Bakery is arguably Calgary’s coolest café. Phil & Sebastian Coffee Roasters has two locations Simmons Building and on Stephen Avenue. Calgary based, Good Earth Café also has two locations Eau Claire Market and 7th Avenue at 5th Street. Caffe Artigiano has two locations along Barclay Mall. Calgary’s Monogram Coffee can be found in Fifth Avenue Place. Downtown also has a very unique Starbucks in Eighth Avenue Place with its minimalist open design with long communal tables rather than individual small tables for two and four. Simmons building is a popular meeting spot on the weekends as it is right on the Riverwalk which is part of the Bow River pathway system. Downtown is full of fun surprises like these bike cafes. How cool is that? Downtown Calgary offers both high and lowbrow dining. It includes four signature Calgary restaurants, the rustic River Café, classic Teatros, Murietta’s West Coast Bar & Grill, and Sky 360, the revolving restaurant at the top of the Calgary Tower. The new kid on the block is Charbar in the Simmons Building, its roof-top patio offers spectacular views of the Bow River and RiverWalk. There is a kaleidoscope of ethnic restaurants downtown, Anatolia (Turkish), Atlas (Persian), Jonas (Hungarian), Pure Contemporary Vietnamese Kitchen + Bar to name just four. And of course, there is no shortage of Asian restaurants in Chinatown. If you love Alberta beef, downtown offers five signature steakhouses – Buchanan’s, Caesar’s, Hy’s, The Keg and Saltlik. Buchanan’s Chop House is known not only for food, but for its its selection of more than 300 malt whiskeys from around the world. The Fairmont Palliser offers a themed afternoon tea by reservation. The theme at the time of this blog posting was a Mad Hatter Tea Party that included Tweeledum Tweedeldee Yuzu tarts and Queen of Hearts red velvet cupcakes – very cool. John Gilchrist, Calgary’s renowned food and restaurant critic has called downtown’s Stephen Avenue Walk one of the best restaurant rows in Canada. The Guild on Stephen Avenue Walk brings the cooking to the street. 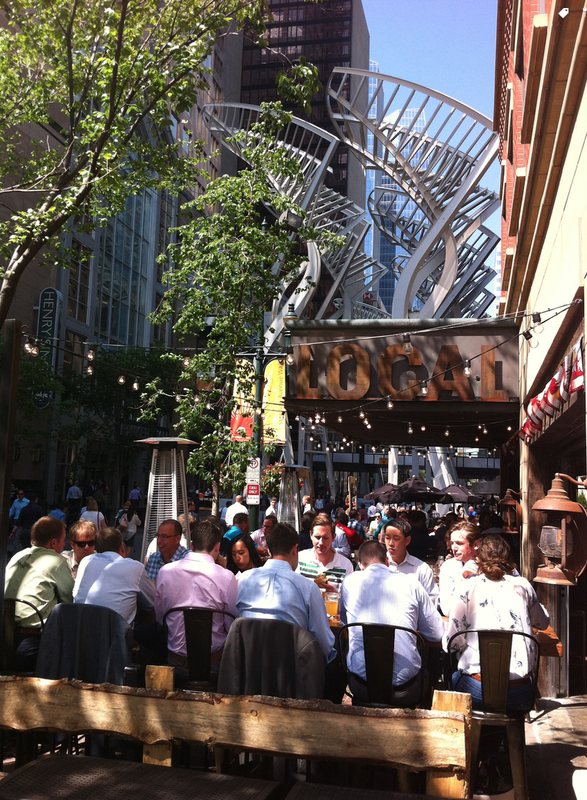 Stephen Avenue is chock-a-block full of patios. Charbar's roof top patio overs great views of the Bow River and downtown skyline. 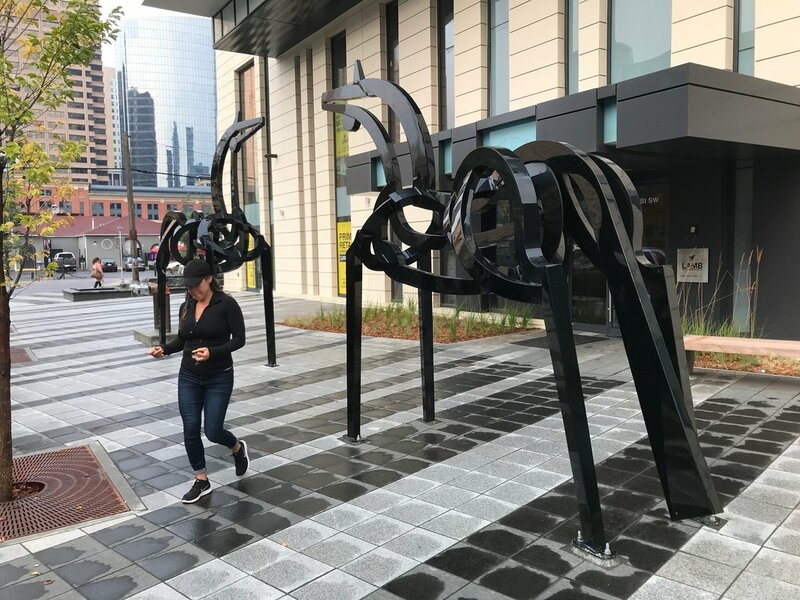 There area few places in Canada let alone Calgary that can match downtown for its combination of architecture and public art all within a few blocks of each other. 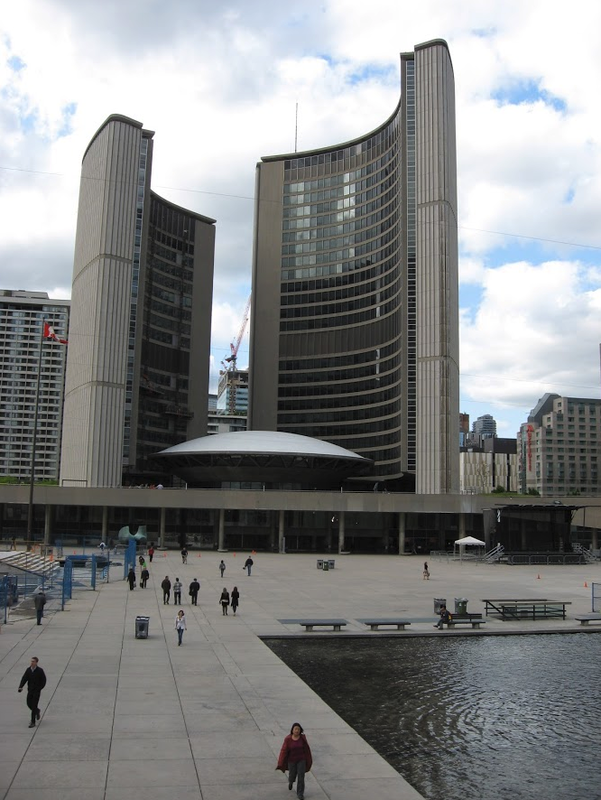 From the historic sandstone buildings (old City Hall and McDougall Centre) to the glittering glass office towers (Bow Tower, Eighth Avenue Place, Nexen Tower and 505 7th Avenue) to the three iconic bridges (Peace, King and Centre Street) and the National Music Centre. Coming soon are two new architectural gems – the new Calgary Public Library and Telus Sky office/residential tower. 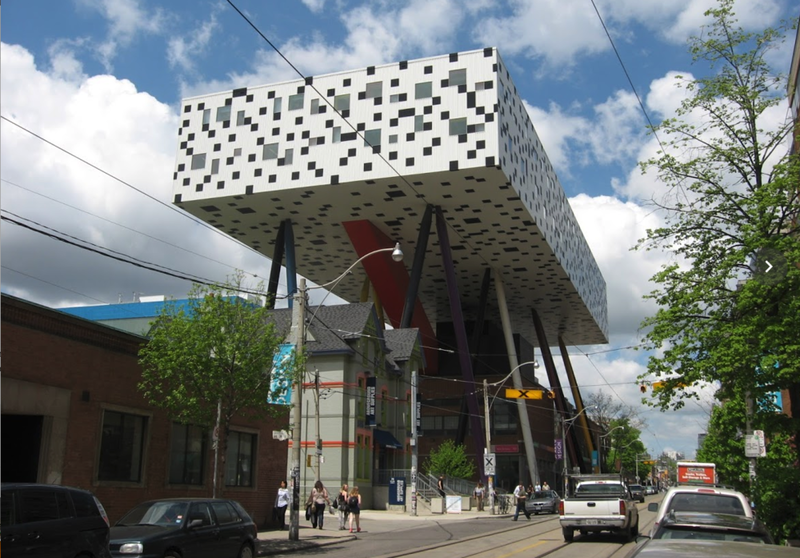 The Library was designed by internationally renowned architectural firm, Snohetta from Oslo while Telus Sky’s was designed by the esteemed Bjarke Ingels Group from Copenhagen. 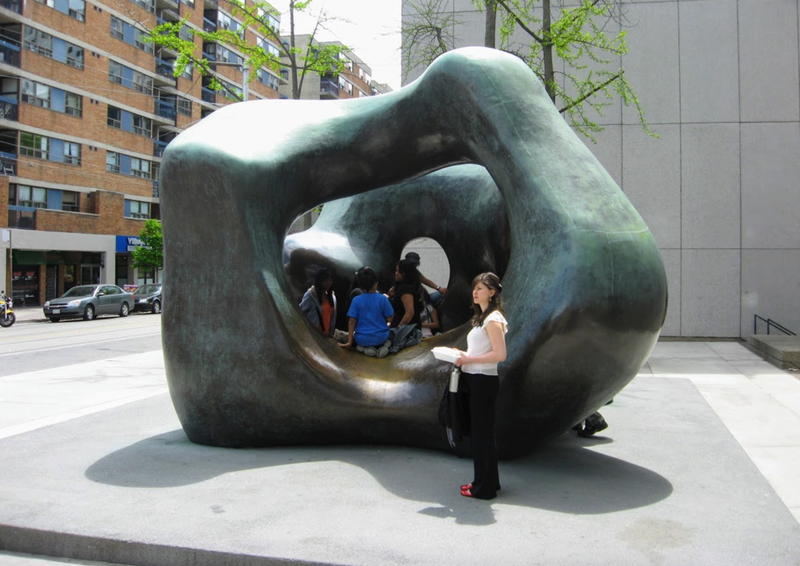 Downtown has literally hundreds of artworks along its streets, in its parks and plazas and along its pathways. 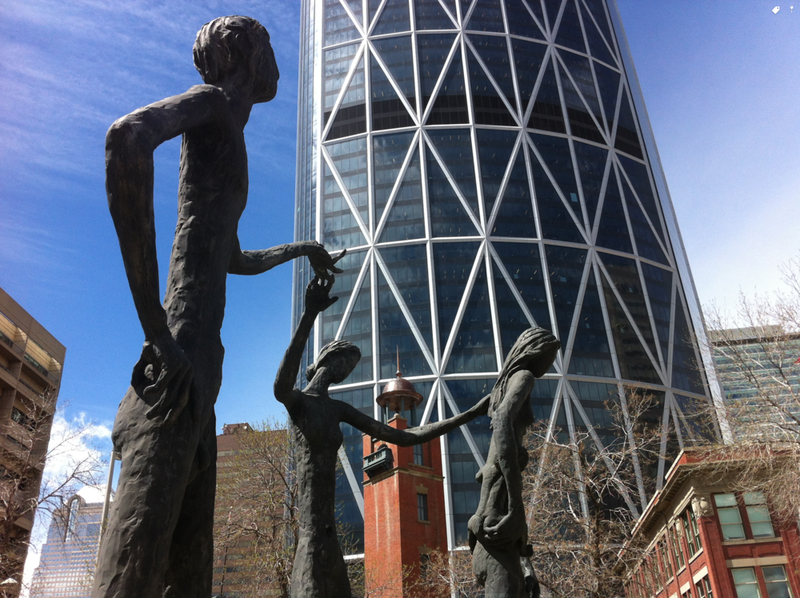 You could easily stroll around downtown all say enjoying the art - from the Famous Five tea party at Olympic Plaza to the Wonderland on the Bow Tower plaza to the Conversation on Stephen Avenue Walk. Did you know that there are artworks in almost every downtown office lobby? The Eighth Avenue Place lobby includes works of renowned Canadian painters Jean Paul Riopelle and Jack Shadbolt. There are also some fun contemporary paintings in relatively new Calgary Centre office tower. Downtown Calgary is one huge public art gallery waiting to be discovered. The Chinese Community Centre is a downtown hidden gem. 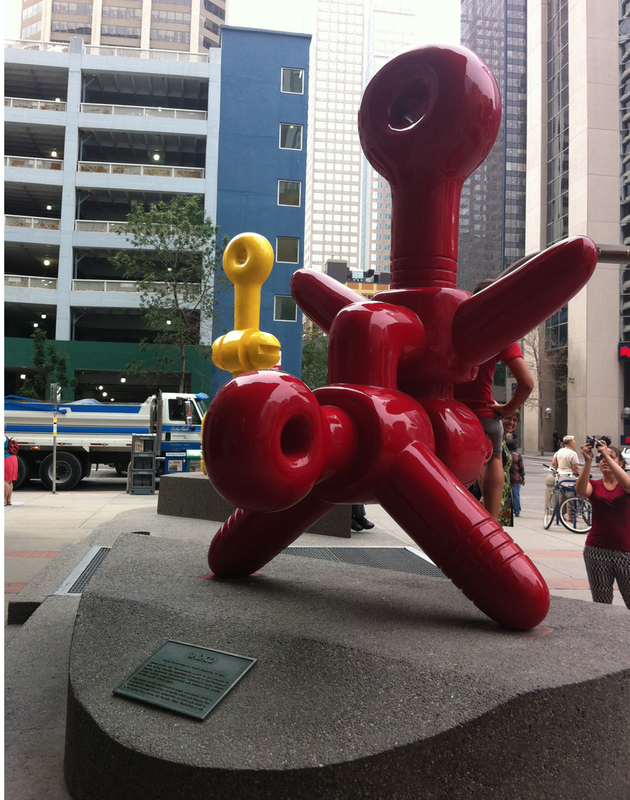 I always smile when I flaneur past Sadko & Kabuki by Sorrel Etrog. Public art like this adds a nice element of fun and colour to downtown living. Calgary Tower and Scotia Centre take on a Salvador Dali-like metamorphosis when reflected in the glass facade of another building. 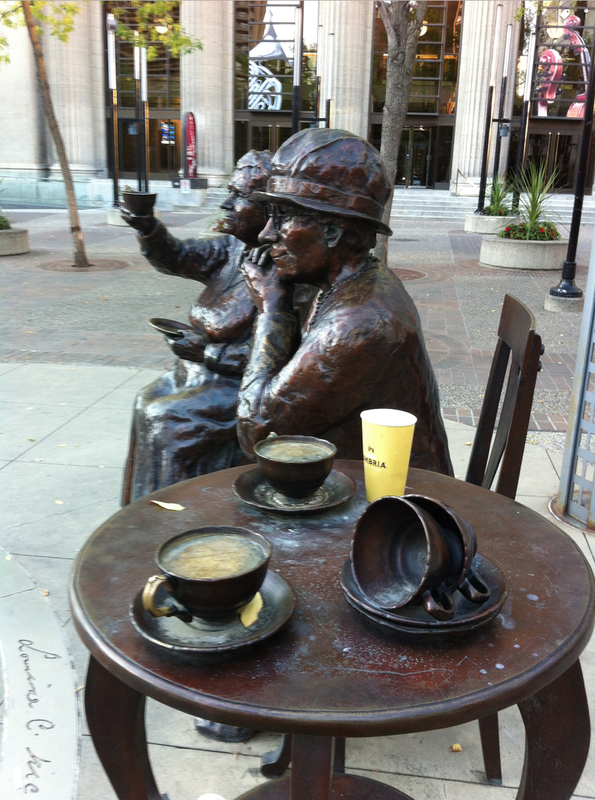 Tea Time in downtown takes on a different meaning at the Famous Five sculpture. Downtown's urbanscape, a rich collage of public art, heritage and modern architecture, makes for a very pedestrian-friendly experience. The lobbies of most downtown office buildings are like mini art galleries. Calgary’s downtown is also blessed with some of the best public spaces of any city its size and age in North America. Any city would be hard pressed to match Prince’s Island (one of the best festival sites in Canada) and St. Patrick’s Island parks. Add Shaw Millennium Park and Fort Calgary Park to the mix and you have four major downtown urban parks. Let’s not forget about Century (soon to get a mega makeover), Devonian and Hotchkiss Gardens, as well as James Short, McDougall and Sein Lok Parks. Impressive! Downtown also boasts Eau Claire and Olympic Plaza, both with wadding pools in the summer, with the latter becoming a skating rink in the winter. 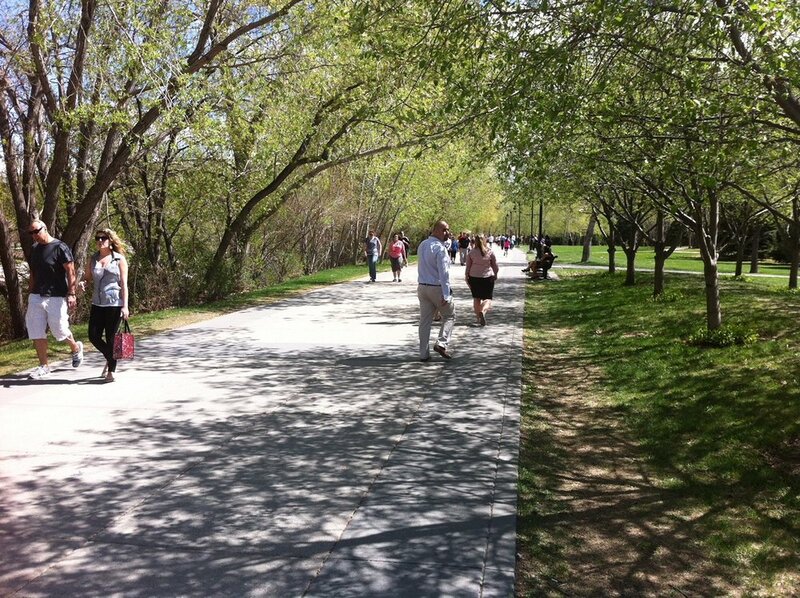 As for pathways, downtown offers easy access to people of all ages wanting to walk, run, board, blade or bike along the Bow River pathways. In addition, there is the a-mazing 20 km +15 elevated walkway. St. Patrick's Island is a special place for families. The Eau Claire wading pool is also popular for young families. 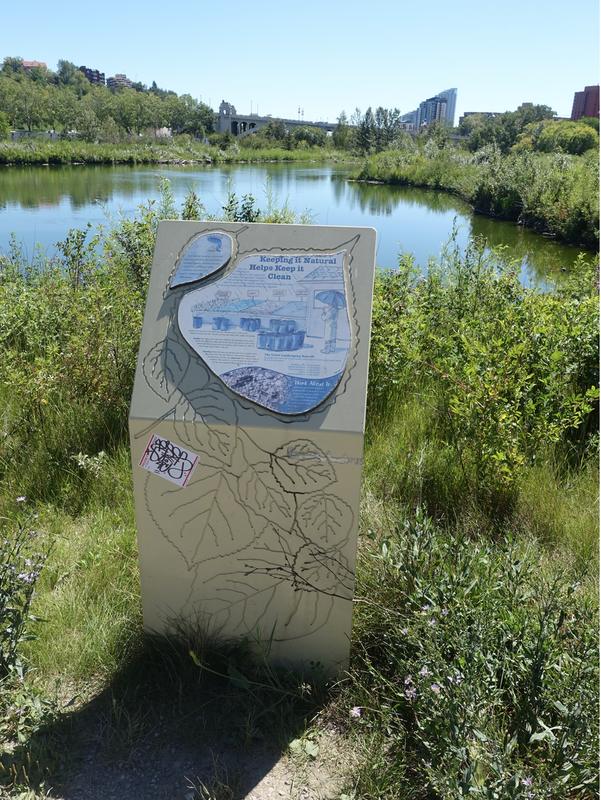 The nature walk at the east end of Prince's Island is lovely oasis as well as educational. Downtown is a place where you can lie back and relax. The +15 walkway is the perfect place to bump into someone you haven't seen for years. The Eau Claire Y has been a very popular family fitness center for decades. Its proximity to the Eau Claire Promenade and Bow River pathway system has resulted in creating a busy year-round outdoor running track. 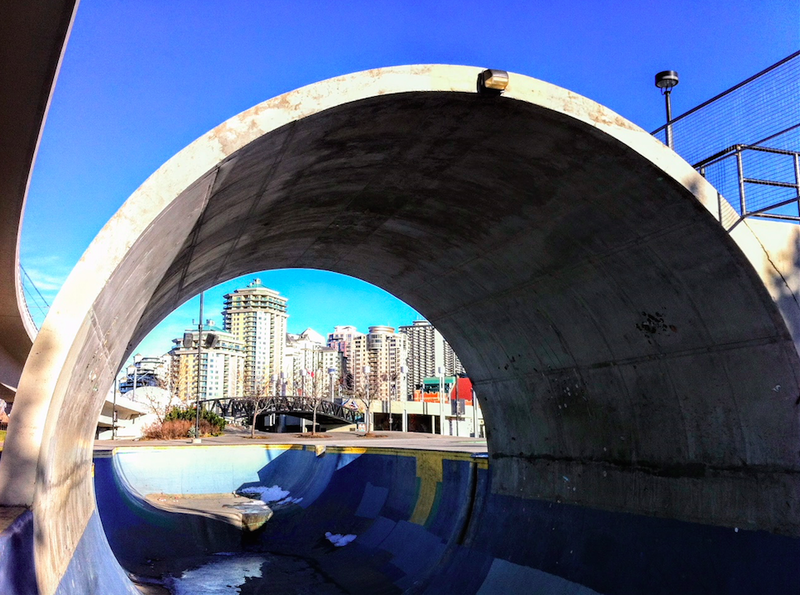 There is also Shaw Millennium Park's mega skateboard park and river surfing on the Bow River under the Louise Bridge. Downtown also has several private fitness centres – Bankers Hall, Bow Valley Club and two Good Life Fitness Centres (including one in the historic 1931 Bank of Montreal building with its gold leaf ceiling on Stephen Avenue). 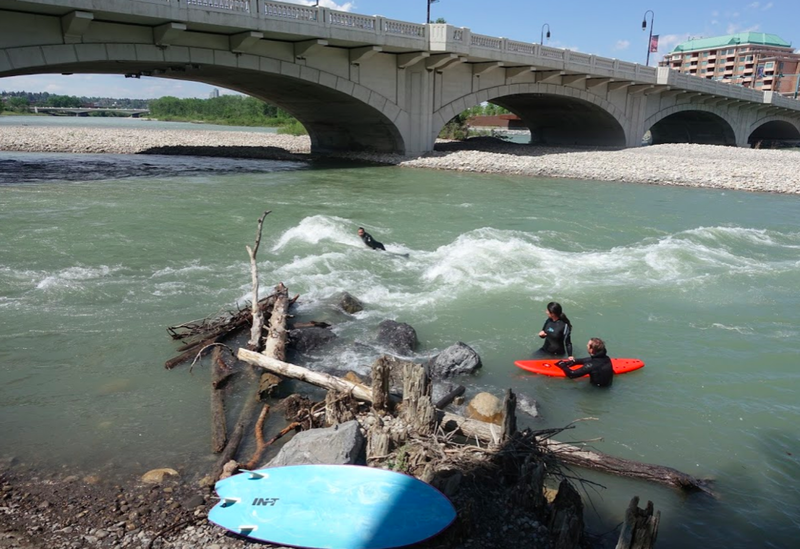 River surfing is become more and more popular on the Bow River. The skateboard part has three separate areas - beginners, intermediate and experts. It is one of the largest free public skate parks in the world. Downtown is a great place to walk, run, cycle or just sit. Downtown Calgary is home to Arts Commons with its 3,200 seats in five performing art spaces, as well as the Theatre Junction Grand, Palace Theatre, Lunchbox Theatre, Vertigo Theatre (two spaces). If you stretch the boundaries a bit, there is also the Pumphouse Theatre way on the west side. 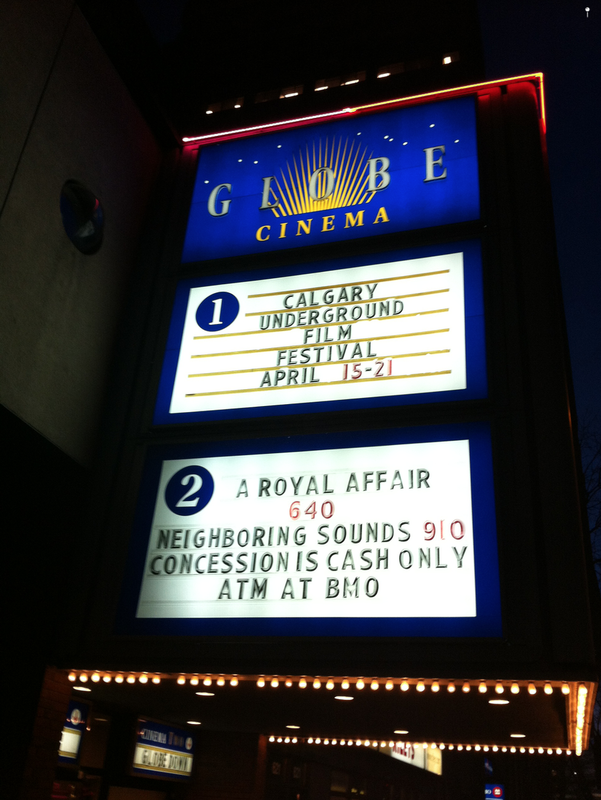 It is also home to the Globe Theatre and Cineplex Odeon Eau Claire for movie buffs. Live music venues include The Palomino Smokehouse and Dickens Pub, as well as three churches – Knox United, Anglican Church of the Redeemer and Central United Church. Downtown also is home to The Glenbow Museum, National Music Centre, Fort Calgary and Contemporary Calgary, as well as several private art galleries. Culture vultures love living downtown as theatre, concerts and exhibitions are all within easy walking distance. Downtown offers a variety of nightlife options. The James Joyce pub on Stephen Avenue is downtown’s quintessential pub, followed closely by Dickens, Fionn MacCool’s, Garage Sports Bar and Unicorn. In the summer the patios along Stephen Avenue Walk create one long beer garden. Downtown is home to Calgary Co-op’s World of Whiskey Store with its 850 different varieties of whiskey. 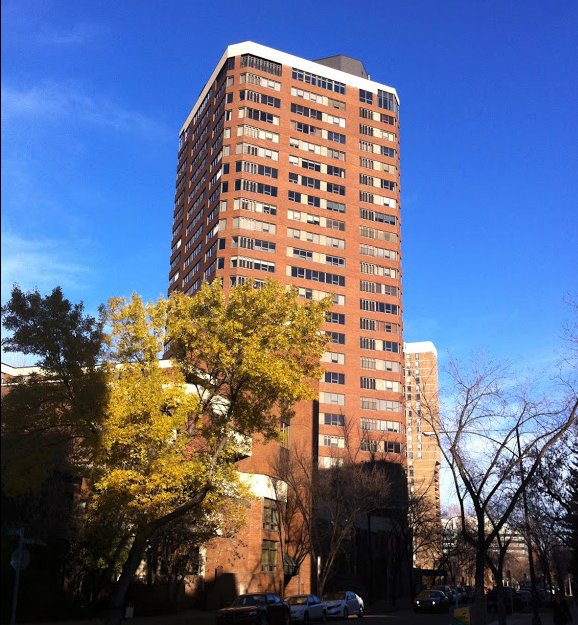 It is located on the +15 level at 333-5th Avenue SW. In East Village’s N3 condo, the Brewer’s Apprentice offers up 48 craft brews. Not only can you sample a few, but you can take home a freshly poured growler or crowler of your favourites. I recently heard Caesar’s Lounge described as nearest thing to time travel in Calgary – think Mad Men. This family-owned Calgary institution hasn’t changed since it opened in 1972. It is known for its “Emperor” size cocktails, i.e. 3oz of your favourite spirits. Downtown's East Village is undergoing a mega makeover designed to create a vibrant urban village for 10,000+ people. For some, POW (Parade of Wonders) is the best FFQ event in Calgary. 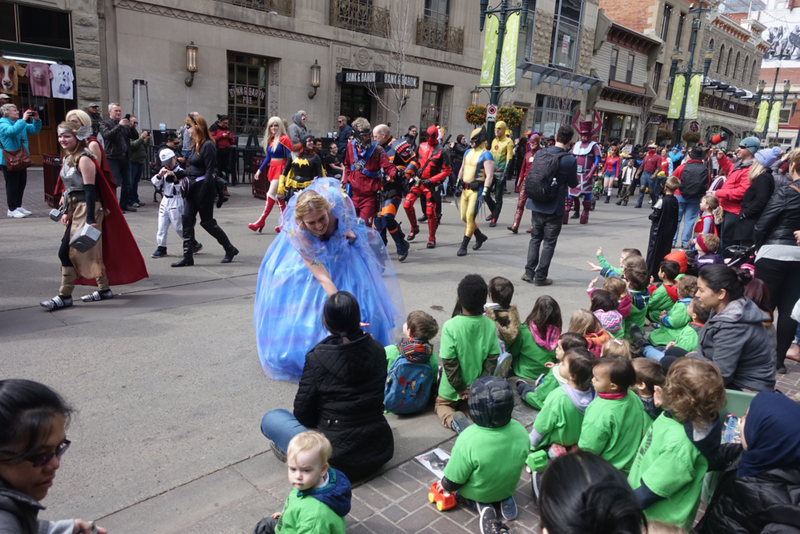 Every spring as part of Calgary Expo, hundreds of Calgarians of all ages get dressed up in their favourite fantasy character and parade from Eau Claire to Olympic Plaza. It is literally a sea of vibrant colours and characters. For others, Calgary’s Gay Pride Parade each August ranks as the best FFQ event in the City. 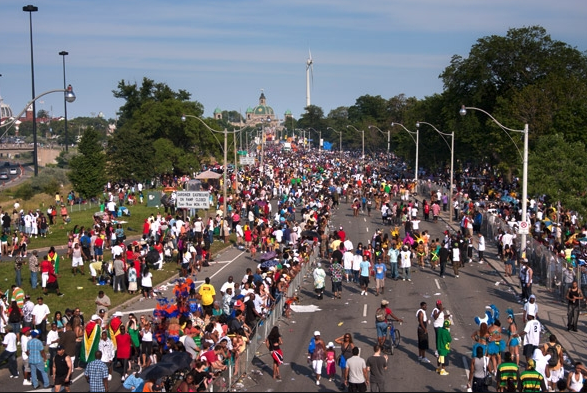 It attracts thousands of colourful participants and tens of thousands of spectators. Downtown Calgary’s “Power Hour” (term coined by a former downtown Hudson’s Bay department store manager in the mid ‘90s for the thousands of downtown workers who power shop at noon hour) is like a parade as tens of thousands downtown workers parade up and down Stephen Avenue. It doesn’t get much quirkier than having an authentic bush plane hanging from the ceiling in the lobby of the Suncor Centre. Or does it? The Udderly Art Pasture on the +15 level of the Centennial Parkade is definitely FFQ. Here you will find a herd (10) of life-size cows with names like Chew-Choo or Moony Trader who have been put out to pasture. Everybody loves a parade...this is the annual POW Parade. Downtown Calgary is a hidden gem when it comes to urban living and it is only going to get better with several new residential developments in East Village, Telus Sky and the new West Village towers under construction. I can’t wait to see the “Northern Lights” light show on the façade of Telus Sky developed by Canadian artist, Douglas Coupland. I have been advocating a Northern Lights inspired light show for a downtown office building for over 20 years. The new Vogue condo is located right in heart of downtown's commercial core. Cidex Group of Companies is currently constructing the first tower of their ambitious West Village Towers project designed by NORR's Calgary and Dubai offices. Note: This is the second in a series of blogs examining what makes Calgary’s City Centre neighbourhoods so cool. 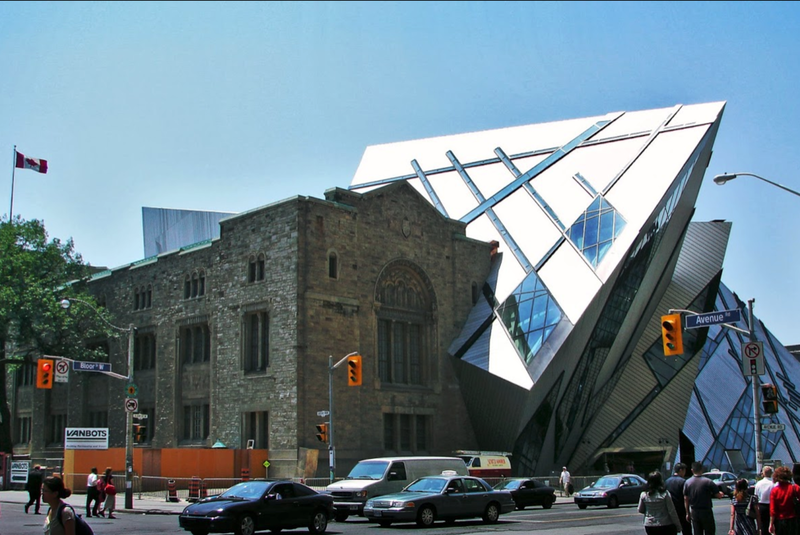 Am I an urban densification hypocrite? Yes I am a city building geek! Yes, I live in a detached 2,000 square foot home in an inner city community surrounded by detached homes, some old tiny cottage homes, but more and more by modern large infill homes some might call McMansions. Large contemporary two and three storey infill homes are slowly replacing the mid-century bungalows in most of Calgary's inner-city communities. And, yes I have and will continue to champion the benefits of older communities like mine becoming more dense and diverse residential buildings and office buildings with commercial uses at street level along transit routes. And I, like thousands of urban planners, politicians, developers and architects have been advocating for decades the need for North American cities like Calgary to add more density - usually in the form of 4 to 12+ storeys residential and office buildings along major roads and transit routes and old malls in established suburban communities. And in some cases even higher than 12 storeys where it makes sense. Meanwhile, I live in my relatively big house (only two of us have ever lived in it) with a front and back yard, two-car garage and still drive to most of my activities. For me, walking and cycling remains mostly a recreational not an everyday activity. Yes, I feel guilty about that too! As well, infill developers are strategically identifying sites for more intense densification like this project near Crowchild Trail. Here is what the new condo with 45 new homes looks like today. Another redesignation sign in West Hillhurst along Kensington Road at 19th St NW which has the potential to become a vibrant Main Street. Because I champion higher density development but live in a low-density home on a low-density street? I believe most City Council members in major North American cities (maybe excluding larger urbanized cities like New York City and San Francisco) in detached single-family homes on streets without any major condo buildings. I have no empirical evidence for this. I also believe most senior urban planners (both private and public sector) live in single-family homes outside the City Centre. Again, show me I am wrong. When I sat on the Calgary Planning Commission, no members lived in condos or in dense communities, yet we were often approving major densification projects the local community was protesting. I believe the same is true for today’s Planning Commission. I expect Olfert's situation is similar to that of the majority of Calgarians. I recently chatted with my millennial dental hygienist who lives in the Beltline in the Calla condo near the Lougheed House, but looks forward to moving to a house to raise a family as does her twin sister. I know, not empirical data - keep reading. New infill condo on 17th Ave SW is creeping west from Crowchild to Sarcee Trail. 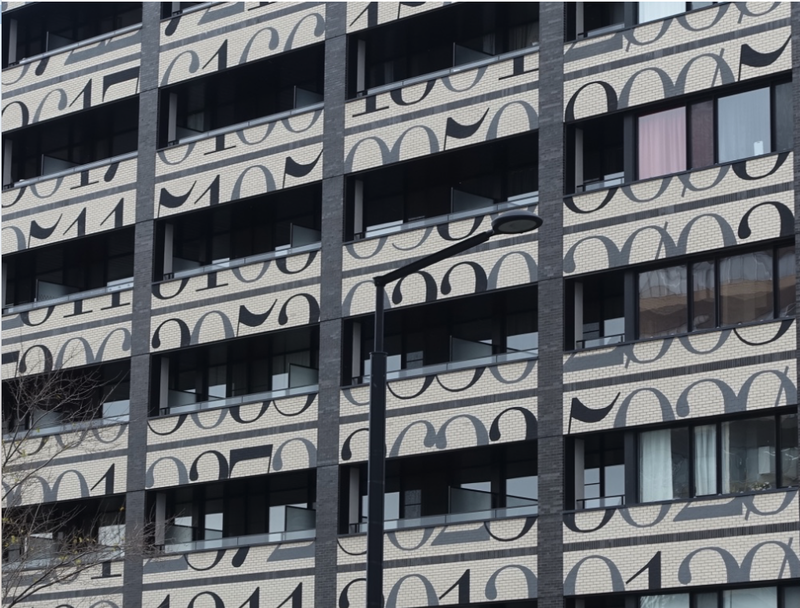 However, this is not new as there are several residential buildings taller than four storeys from the 70s and 80s. Why do people hate density? Most people hate tall buildings and would prefer to live in a detached home or perhaps a small complex of homes with both front and back yards. This time I do have some empirical evidence. In October 2017, Canada Mortgage Housing Corporation (CMHC) surveyed 2,507 Canadians who intended to buy a new home in the next two years. 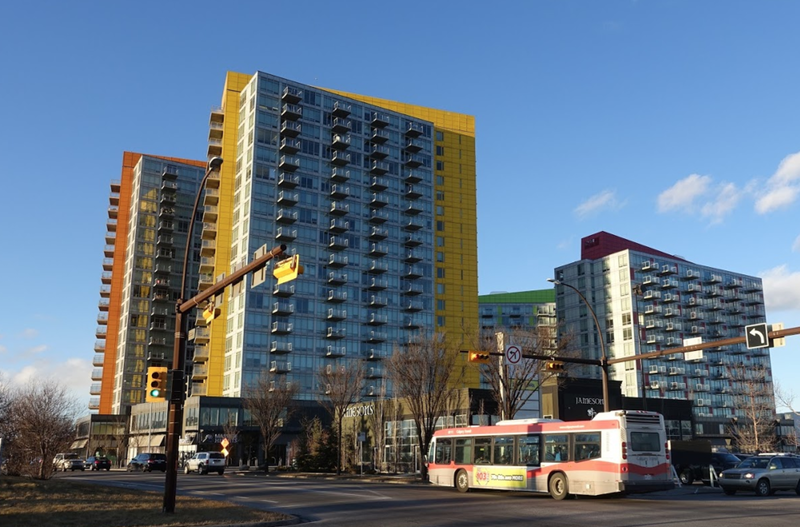 The four colourful condo towers at the Brentwood LRT near the Co-op grocery store, and within walking distance to the University of Calgary were opposed by neighbours. There is in fact lots of data, documenting that when it comes to urban living humans like what is called “human scale” buildings commonly thought of as being no taller than nine or 10 storeys – think Paris or Barcelona. Yet, it is rare a new Calgary condo project (even when it is under 10 storeys) proposed in older community next to single-family homes isn’t greeted by neighbours kicking and screaming about how this is going to ruin their neighbourhood. Four examples are, St. John’s on Tenth and Ezra on Riley Park (both in Kensington), Legion (in West Hillhurst) and AVLI (in Inglewood). Eventually, all four got approved but not without a fight. 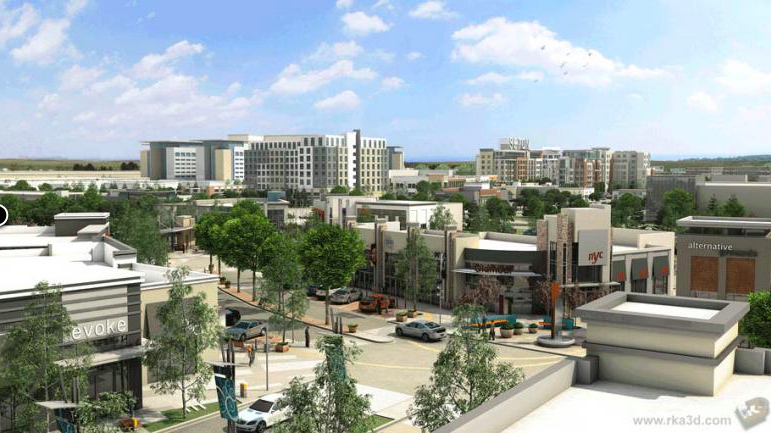 Currently, two new battles are about to erupt - The Grid (in Inglewood) and Carlisle Group’s Glendale project. A recent visit to Hamilton and the same was happening that city and in Burlington. The density advocates just roll their eyes, when they hear people’s concerns about parking, shadows, increased traffic and crime, or that the proposed development is out of context with the scale of the other nearby buildings. While many densification advocates dismiss the neighbours’ concerns as a case of NIMBYism, I am beginning to wonder if it is the densificationists (planners, politicians and developers) who are the NIMBYist in that they are prepared to propose, approve and build high-density developments in locations as long as they are not in their backyards. Indeed, I could be accused of this as I publicly supported the conversion of the single story Legion building in West Hillhurst to be redeveloped to accommodate an 8-storey condo and 4-storey office development in my neighborhood that was adamantly opposed by many in my community. To me redevelopment of the Legion site made perfect sense. It is along a major bus route and within walking and cycling distance to downtown and just blocks to the Bow River pathway. There is an emerging main street along 19th Street NW and it is close to schools and a recreation center. Sounds like a recipe for an urban living node if I ever saw one. But, full disclosure, it was 10 blocks away from my home so not exactly in my backyard. Along 20th Ave NW from 14th St to 19th St you can see how the scale of housing evolves from mid 20th century to early 21st century. Note the height of the 3 storey condo building isn't any higher than the infill duplex. Human scale condo on 19th St NW add to the potential of creating a vibrant main street with neighbourhood shops at street level along 19th St NW. The rationale: mid-rise buildings have the ability to synergistically connect with existing suburban development as their “human scale” integrates better with single-family homes while still creating the density needed to support better transit service. Mid-rise buildings also accommodate larger tenants like grocery stores, family restaurants, recreation, health and office buildings which complement the smaller boutique shops, cafes and bistros. Never the less in reality, few Canadians welcome large infill condo buildings near their house. Just ask Margaret Atwood who opposed a proposed modest eight-storey, 16-unit condo building near her home in 2017. Mid-rise development is changing the face of Kensington's 10th St. NW with retail and restaurants at street level and residents above. Indeed, the biggest challenge facing urban planners in North American today is trying to figure out how to densify and diversify their late 20th century communities that are a sea of detached homes and little else. The urban density missionaries tell us these communities are not sustainable in the 21st century. However, there are hundreds of millions of people who love their 20th century suburb just the way it is. As long as the Canadian dream is still to own a home with a front and back yard on a street with other single-family homes, the urban densification battle will continue. Every new infill condo will be a battle between the locals and the outsiders (developers and urban planners). Some see urban densification as an urban revolutionary process, while others see it as the natural evolution of any city as it grows and adapts to new economics, markets and attitudes. 5th Avenue at 12th Street NW illustrating how older homes are being replace by mid-rise condos. 5th Ave also has the potential to become an attractive cycling route, with parks, schools, community and recreation centers nearby. Townhomes at the base of mid and highrise condos create a transition from low to mid density. In Britannia the mid-rise mixed-use building steps down next to the single-family home to create an attractive transition. I am not sure who will win the war, but in the meantime I will enjoy my detached home, two car garage, front and backyard gardens, great neighbours and the park across the street for probably another decade and then decide where I want to live. Perhaps I should spend less time on Twitter reading and responding to the incestuous tweets back and forth from the urban densification missionaries that make me feel like a hypocrite. Why NIMBYs speak louder than YIMBYs? Kensington Legion: Why taller is better? 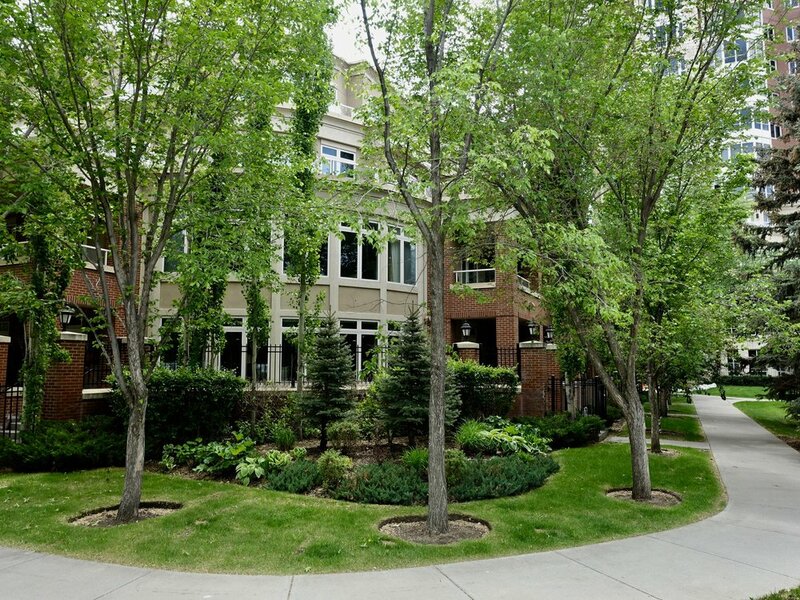 Calgary: West District: A model mid-rise community! An urban oasis in a sea of suburbia has begun construction on Calgary’s west side in the community of West Springs. Currently called West District, it will probably be renamed, hopefully to something like Broadcast Hill, in recognition the area’s history as home to CFCN, Canada’s first independent television station. 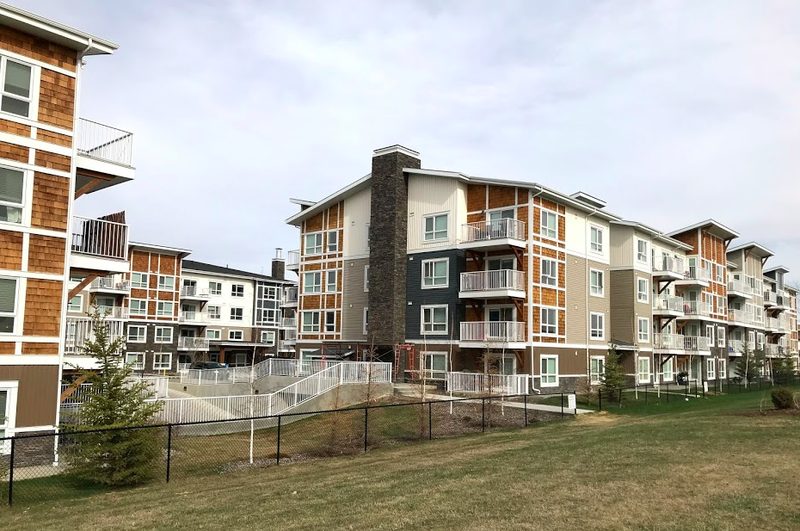 West District is a very ambitious project by Truman, a family-owned Calgary developer and builder who, to date, has invested over $100 million in assembling the land, developing the master plan and managing the complex approval process. It has taken 5+ years to get to the construction stage which included a four-phase community engagement process (April to November 2014) which resulted in 1,200+ ideas from the community that were then evaluated and where feasible included in the first draft of the master plan. Truman then participated in a City-led engagement process to complete the final plan Council approved in late 2017. When completed West District will have approximately 2,500 new homes (98% of them condos or townhomes) for 4,500 people. As well, 825,000 square feet of office/institutional and 300,000 square feet of retail will employ approximately 3,600 people. It is the perfect balance of live, work and play. West District’s crown jewel will be its unnamed $15.5 million central park (my vote goes for Buck Shot Park, in recognition of the popular CFCN children’s show Buck Shot enjoyed by hundreds of thousands of children from 1967 to 1997) that took over a year to get approved in principle. Why so long? 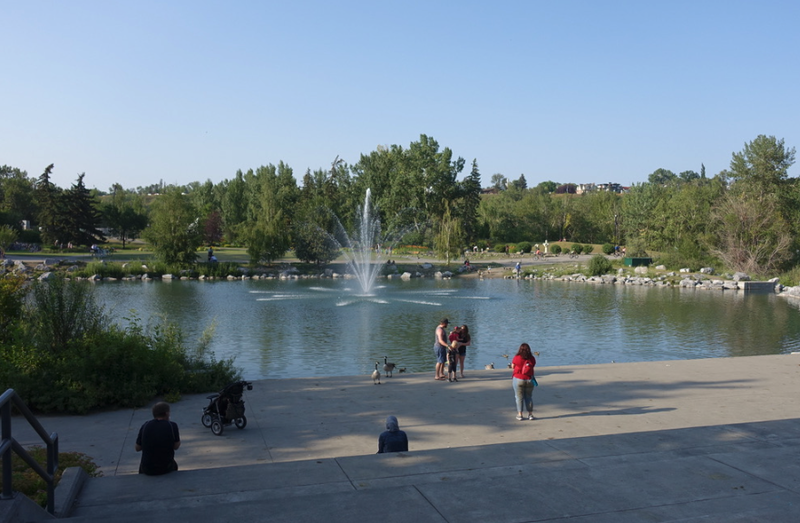 Because it the first park of its kind in Canada that incorporates an integrated storm water pond with a public park (normally storm water ponds have no public access). The 8.4-acre park will also include a 500-seat amphitheatre, skate park, skating rink, spray park, basketball court, playground, great lawn, pathways and a large amenity/event building – think East Village’s Simmons Building on steroids. The park will be a hybrid between Olympic Plaza and St. Patrick’s Island Park. It will also have a seven-block long main street lined with shops at street level and seven floors of residences above. The feel will be one of a modern Paris streetscape. In fact, nearly 80% of the buildings in West District will be between 5 and 8-storeys high, creating one of the highest densities of mid-rise buildings in Canada. The master plan doesn’t include any highrises (above 12-storeys). Another unique feature of West District’s Main Street will be its “activity centre street,” classification which includes a wide sidewalk for pedestrians and patios, a dedicated bike lane and two traffic lanes each way. In the future, it will be home to a transit hub connecting the community to nearby amenities and LRT. There will be no surface parking lots in West District. Jennifer Keesmaat, Canada’s current urban planning guru and former chief planner for the City of Toronto has been advocating the advantages of mid-rise buildings for infill projects for years. The rationale - mid-rise buildings have the ability to synergistically connect with existing suburban development as their human scale integrates better with single-family homes while still creating the density needed to offer better transit service. The mid-size buildings also accommodate larger tenants like, grocery stores, family restaurants, recreation, health and office buildings which complement the smaller boutique shops, cafes and bistros. Diversity of scale is also important to creating a vibrant urban community. 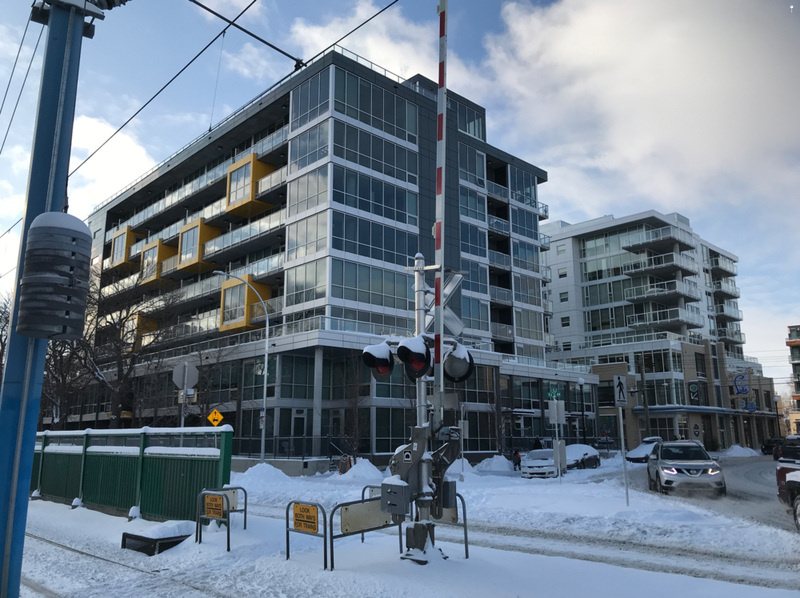 Truman, working with Calgary’s CivicWorks Planning + Design, are creating a model mid-rise community that could well serve as a model - on a smaller scale - near LRT stations across Calgary. West District is the legacy project for George Trutina, President of Truman, who has devoted 30+ years building communities in Calgary, Chestermere and High River. Note: An edited version of this blog was published in the March 2018 edition of CondoLiving Magazine. Calgary’s suburban communities have often been critized by urbanists as brown, beige and boring. The same could be said for most of Calgary’s early City Centre condo towers like Westmount Place (1979), The Estate (1980) and Eau Claire 500 (1983) immediately come to mind. It is true - the preponderance of dull and dreary brown and beige buildings makes for a very depressing urban landscape, especially during Calgary’s winter when the grass is brown, the streets are covered with gravel and the leafless trees are a brownish grey. Thank goodness for Calgary’s deep blue winter skies! Fortunately at the turn of the 21st century, Calgary architects and developers began to experiment, integrating coloured glass and panels into their exterior designs. The front entrance of Pixel looks like a hip New York nightclub. Battistella Development’s Orange Lofts (2003), designed by Kasian Kennedy of Vancouver, used a bright orange-red, ladder-like element on the exterior of the building creating an eye-catching industrial look that began the rebirth of East Village. Colours (2008) employs a two-story, stain glass like “Art Wall” that encloses and attractively disguises the building’s above ground parkade. Pixel (2014) not only sports bright yellow squares randomly wrapping around a few balconies but also has a very cool and colourful entrance that looks like a hip New York nightclub. Colours by Battistella has one of the best above-ground parkade designs I have ever seen. 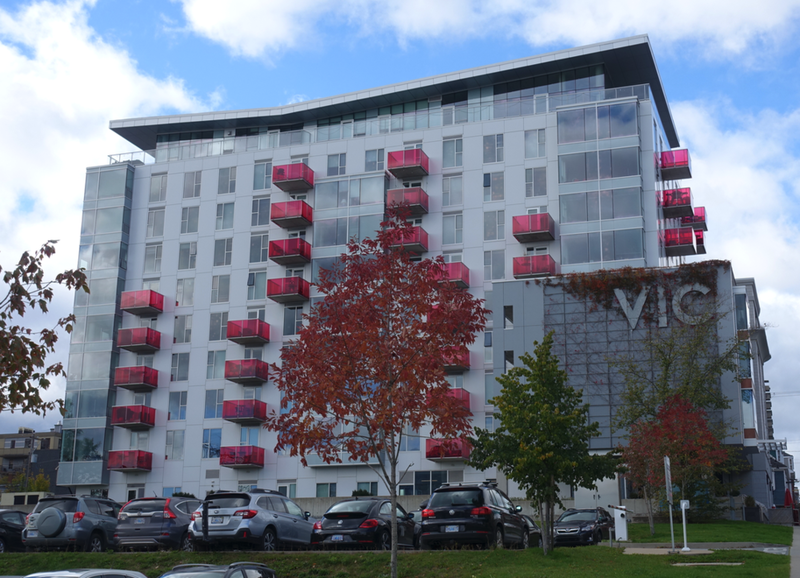 Not to be outdone, Knightsbridge and Metropia engaged Calgary’s GEC architects to design four big, bold and colourful condos at the Brentwood LRT station from 2010 to 2014 named University City. Each tower is distinguished by a brightly coloured angular plane that thrusts itself out of the middle of the each building. University City's colours remind me of neighbourhood playground. This playfulness will become more appropriate as the planned transit oriented develop next to the Brentwood LRT station creates an urban playground. 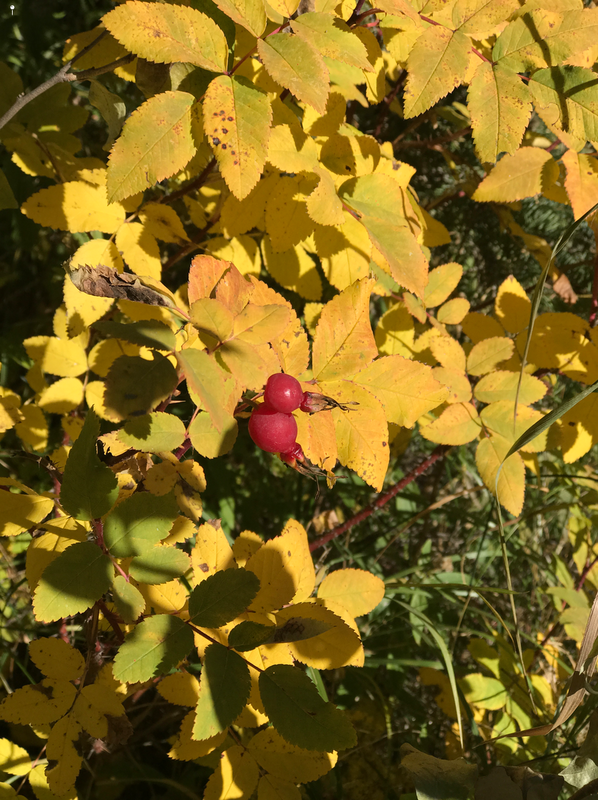 The inspiration for University City's colours (red, yellow, green and orange) come from native prairie grasses, bushes and flowers. The I.D. Inglewood condo by Sarina Homes completed in 2016 at the east end of 9th Avenue SE, features three-storey high red balcony boxes that recall the red ladder of the Orange Lofts and perhaps the Alberta Children’s Hospital windows. Marda Loop’s GLAS condo (2017) designed by Calgary’s Sturgess Architecture recently won a Honourable Mention at the Mayor’s 2017 Urban Design Awards. Its design is dominated by the two-storey high salmon-coloured window boxes that definitely recall the fun oversized windows of the Alberta Children’s Hospital. 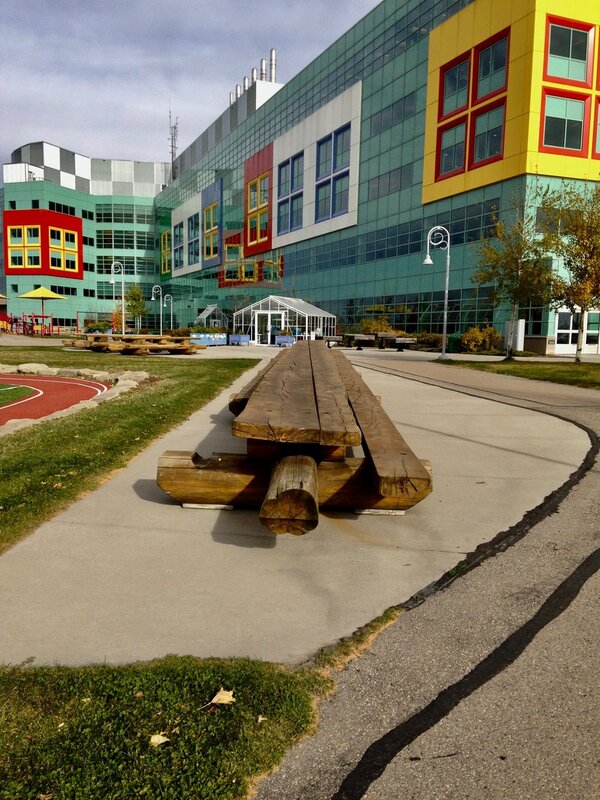 Alberta Children's Hospital was designed with input from children. NORR architects employed bold coloured lines to give Auroa I both a vertical and horizontal thrust. All these examples use pops of bold colour to create a more visually interesting exterior. However, that is not always the case. 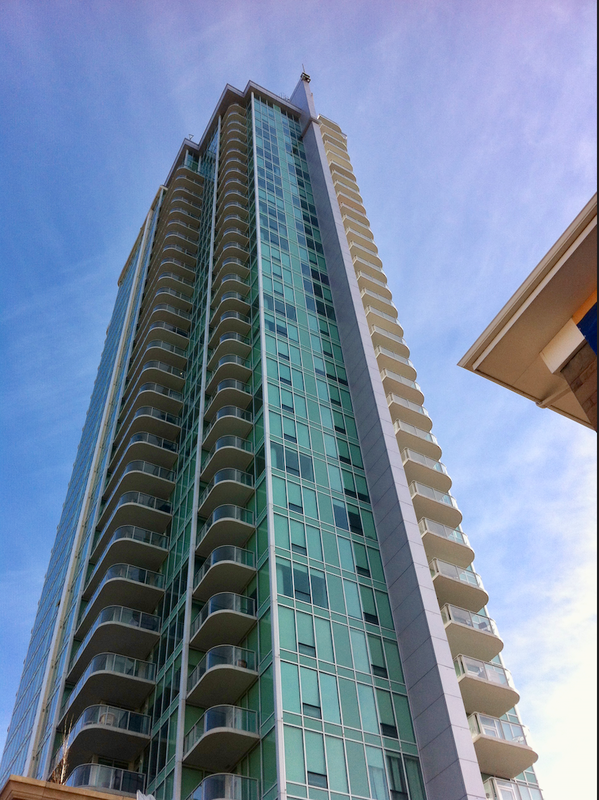 Built in 1999, the Point on the Bow condo in Eau Claire is a case in point. It was Calgary’s first condo to embrace the new coloured glass curtain wall technology that would become architects “go to” technology in the 21st century. The architects at Gibbs Gage covered almost the entire façade with emerald green glass that some thought harmonized nicely with the green hues of the Bow River at certain times of the year. And then there is Attainable Homes’ Mount Pleasant 1740 condo designed by Calgary’s Sturgess Architecture and completed in 2016. 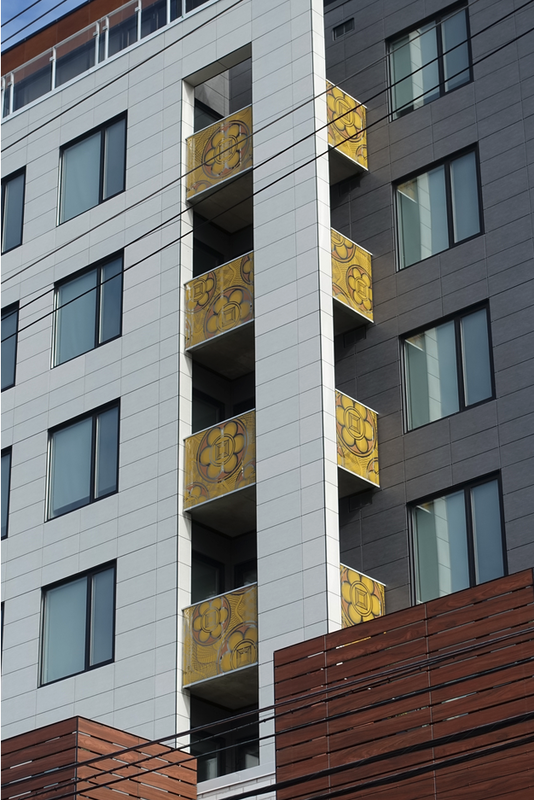 The façade is dominated by glowing (some say gaudy) neon greenish yellow panels that may have residents across the street wearing sunglasses. There is certainly nothing drab or boring its design. All the above examples employ the use of bold colours. 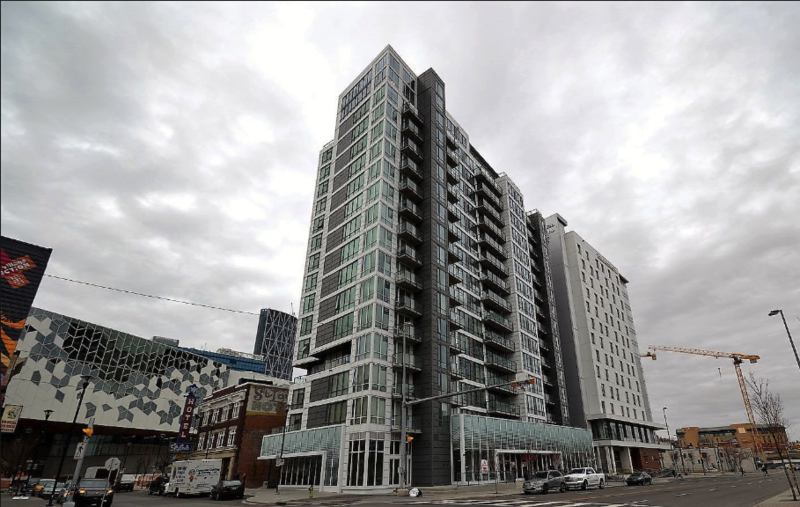 However, Landmark-Qualex’s Mark on 10th (corner of 10th Ave and 8th St SW) dares to be different. 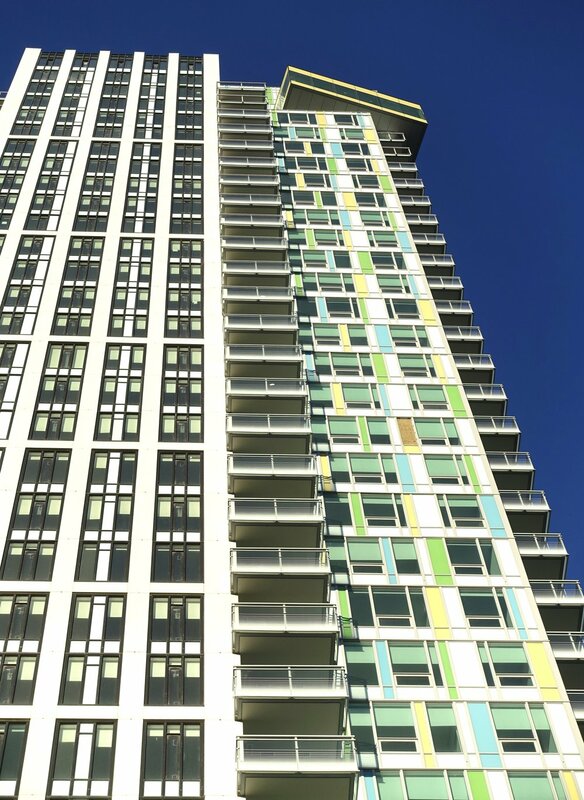 Designed by Vancouver’s Raffi architects, it incorporates panels of pastel blue, yellow and green hues randomly inserted into the opaque panels, creating a softer more feminine façade. The uniqueness of the building is reinforced with the cantilevered yellow box at the top and the two-storey yellow glass greenhouse space with its bamboo tree growing at the 10th Ave entrance. The design is bold yet subtle. Mark on 10th utilizes several pastel colours with a strong vertical and horizontal lines to create a contemporary stain glass design that recalls the art of Piet Mondrian. Arriva completed on 2007, also utilized pastel colours to create a warm and inviting facade enhanced by the contrast between the curved balconies and the sharp edges of the windows and corners of the building. There is a pleasing softness to this rounded design. Perhaps that is why most timeless architecture has little colour. NORR architects edgy new University of Calgary residence creates a strange juxtaposition withthe beige residences from the 70s and 80s that surround it. An edited version of this blog was published in the Calgary Herald's Condo Xtra magazine, February, 2018, hence the focus on condos in this blog. During the 2017 Stanley Cup playoffs, Nashville received a lot of attention for how its downtown came alive on game days as the Predators strived to win the Cup. On game nights, tens of thousands of fans who didn’t have game tickets flooded their downtown to watch the game on huge screens outside the arena. Nashville’s arena and the next door convention centre were thought by some to be the model for what a new arena and expanded convention centre could do for Calgary’s Stampede Park and City Centre. I had to see this for myself, so I planned to be in Nashville for the opening home game of the Predators’ 2017/18 season. Note: An edited version of this blog was published in the Calgary Herald (New Condos section), titled, "Nashville is wrong model for reviving Stampede Park" on Feb, 3, 2018. Bridgestone Arena plaza that open up to Lower Broadway is empty most of the time even though it is also home to Nashville Tourist Information Centre. I spent 12 days in Nashville, wandering the area around the arena and convention centre almost every day. What I found was the streets next to the arena and convention centre were dead except on game days. Only once did I find the arena plaza animated and that was for the annual “Gold Walk.” That’s when, before the first home game of the season, at around 4 pm the Predator players walk into the arena along a gold-coloured carpet. Lined with fans and cheerleaders, it’s a bit like how football players enter the stadium before a game. 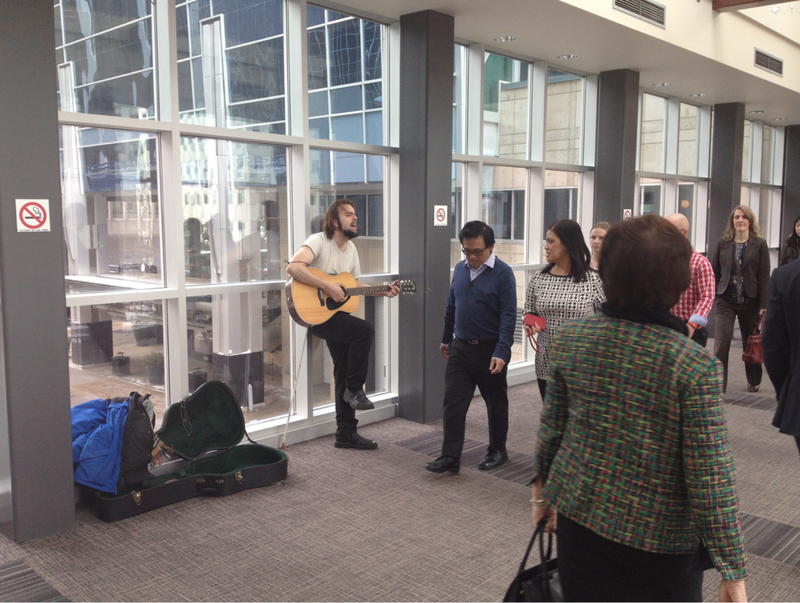 Though, it seemed a bit hokey to me, the few hundred Nashvillans in attendance clearly enjoyed it. But, on opening game night, it was not hockey but the 50th anniversary celebration of the nearby Tootsie’s Orchard Lounge that drew thousands of people to the street outside the arena. The block of Lower Broadway - across from the arena - was closed for an all night outdoor concert with free live music by the likes of Alberta’s own Terri Clark. There was no street animation at any time on three sides of the arena that are blank walls to the street. For the entire 12 days, the cavernous 2-block long convention centre was empty, or at least it appeared so from the street. I did go in several times but nothing significant was happening and it certainly did nothing to create street vitality. The Bridgestone all-purpose arena was built in 1996. However, only now, 20 years later are new private sector developments happening around it – Bridgestone and Pinnacle office towers, a mixed-use building (including the National Museum of African American Music) under construction, as well as numerous hotels. It is the new convention centre, Country Music Hall of Fame and Museum and the growing popularity of the live music experience along Lower Broadway that are the real catalysts for new downtown developments like the impressive Omni hotel. Nashville’s main street, Lower Broadway is a gritty street lined with of loud honky-tonk bars that offer free (no cover charge) live music from 10 am to 3 am. The bands play at the front the bars with the windows open so you can hear the music and see the musicians as you stroll along. Think of it as one long street party 365 days of the year. Over the past decade or so, Nashville has done a good job of revitalizing its downtown by making it a major tourist attraction. The key to the revitalization is the free music 365 days of the year (similar to Las Vegas’ gambling and shows). Note: The NISSAN stadium, home of the NFL Titans, is across the river from downtown sits vacant most of the time. 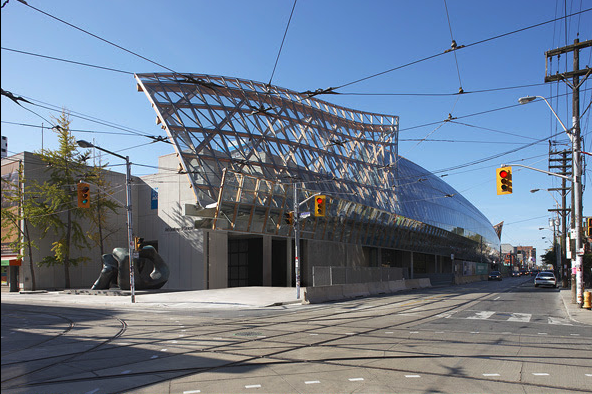 Opened in 1999, to date there has been no other development around it. That should be a “red flag” to anyone thinking a downtown stadium is an automatic catalyst for other developments. The new convention centre looked lovely, but I never saw anyone use this patio during our 12 days stay, not did I see the centre full of people at any time. As Calgary contemplates the development of an expanded BMO Centre and new arena at Stampede/Victoria Park, we need to be realistic with our expectations. Calgary’s ability to become a mega urban tourist attraction is limited by our accessibility to major tourist markets. For example, there are 12 million people within a 2.5 hr. drive of Nashville and 250 million within a 2-hour flight. In comparison, Calgary has but a small fraction of that – one million within a 2.5 hr. drive and maybe 15 million within a 2.5-hour flight. Our weather is also a factor. In North America, the peak convention and trade show months are from September to June, which for Calgary means cool if not downright cold weather. In Nashville, even in mid October it was warm enough for shorts - daytime and evenings. And to be brutally honest, Calgary also lacks a unique sense of place or history essential to becoming a year-round urban tourist attraction. Nashville is well known internationally as the birthplace of country music, which it has capitalized on to become a year-round music destination. 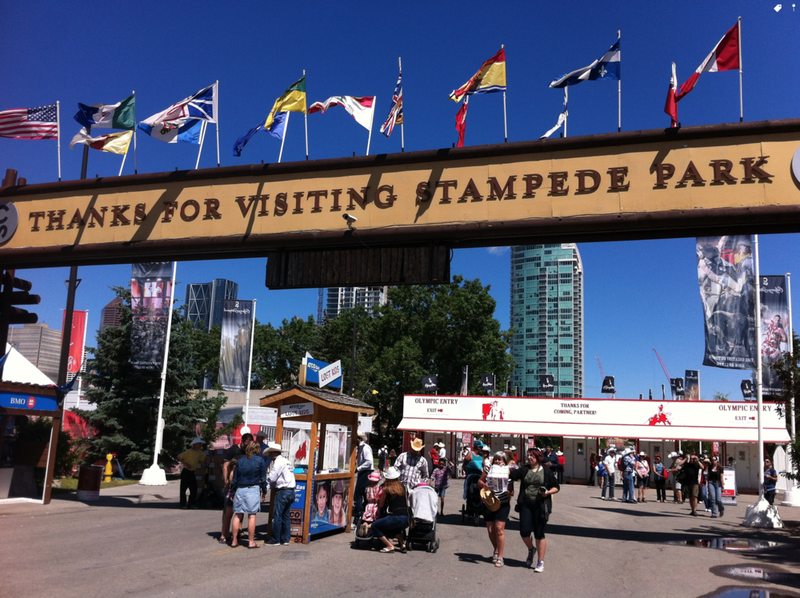 Unfortunately, the Calgary Stampede, a 10-day event, doesn’t allow for a year-round tourist experience. If Calgary is serious about becoming a tourist city, albeit not on the scale of Nashville, we need to transform Stampede Park into vibrant Sports Hospitality Entertainment District (SHED) for locals first and then tourists. Stampede Park has been trying to expand for over 20 years. Will a new arena and expansion of the BMO Centre be the catalyst to create a vibrant year-round sports, entertainment, hospitality district (SHED)? Does it really make sense to spend $500M+ to build a new arena just a block away that will have less seats for public and more seats for corporate fans? Expand the BMO Centre and repurpose the downtown Calgary TELUS Convention Center. We can’t afford to market and manage two similar facilities. Create a vibrant Main Street (live music venues, pubs, restaurants, cinemas, cafes, shops) along 4th Street SE linking East Village, Victoria Park and Stampede Park. Build a new arena or an upgraded Saddledome and manage it as a major entertainment/events facility not just a sports centre. Build a Stampede Museum/IMAX where tourists and visiting family and friends can enjoy the history and “spills and thrills” of the Stampede experience year-round. Open up Stampede Park along Mcleod Trail so passers-by can see into the park. Open up the 17th Avenue entrance to vehicular traffic. The next evolution of Stampede Park will be from restricted gated-community to an open community where people are free to walk, cycle and drive through like any other community in Calgary. Stampede Park: A place to live? Given Calgary doesn’t have access to a large tourist market, the key to a vibrant Stampede Park SHED will be to surround it with thousands of condos that are attractive and affordable to Calgarians of all ages and means. 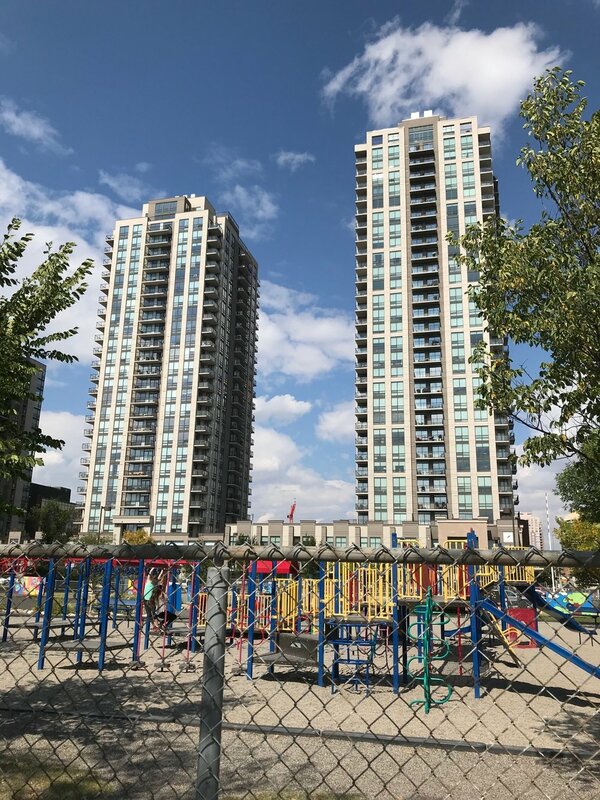 Stampede Park must become the front yard, back yard and outdoor living room for thousands of Calgarians living in East Village, Victoria Park, Erlton, Inglewood and Ramsay. It must become a year-round urban playground. We need residential projects like Lamb’s The Orchard (485 units), Anthem’s Crosstown (874 units + grocery store) at Erlton Station and Cidex’s HAT@Elbow River (1,200 units) on the Elbow River Casino site to happen sooner rather than later. 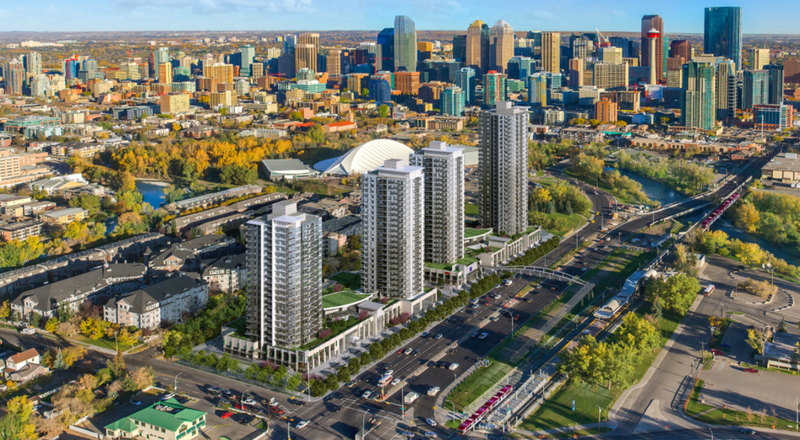 Anthem Properties has plans to build four condo towers next to Stampede Park and the Erlton LRT station in the future. Stampede Park would be their playground. Lamb Corporation has plans for two towers along 11th Avenue and 5th St SE. 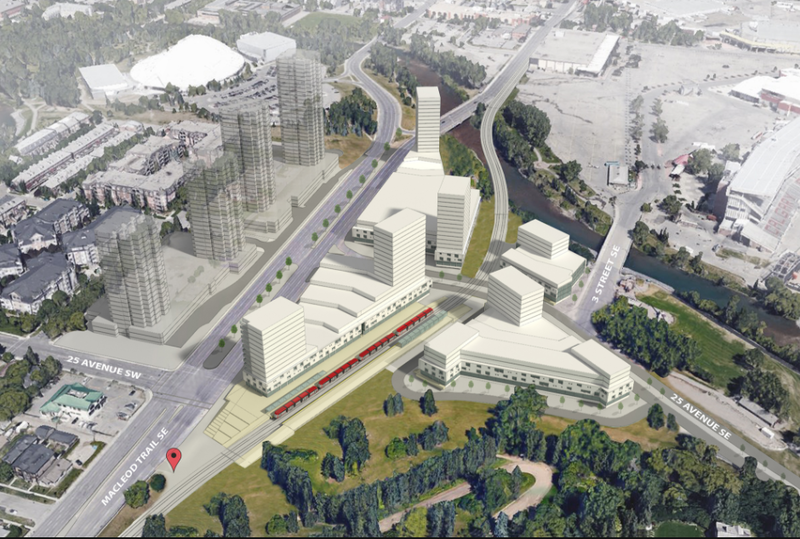 This is a conceptual plan developed by Sturgess Architects for the redevelopment of the land next to Erlton Station with the Anthem towers included. Remington Developments owns the land south of the CPR tracks that was at one time earmarked for the mega Railtown development that would have included office, condos, shops, LRT and high speed train station. Calgary will be hosting 25,000 International Rotarian Convention attendees in 2025. What a great opportunity to showcase Calgary’s new 21st century Stampede Park as a year-round tourist destination to the delegates. There’s no time to waste. The Stampede Board, Mayor, Council, Calgary Municipal Land Corporation and Calgary Sports and Entertainment Corporation must begin working quickly to develop an exciting share vision for Stampede Park. We MUST work together if we want to make our city a major year-round tourist attraction.